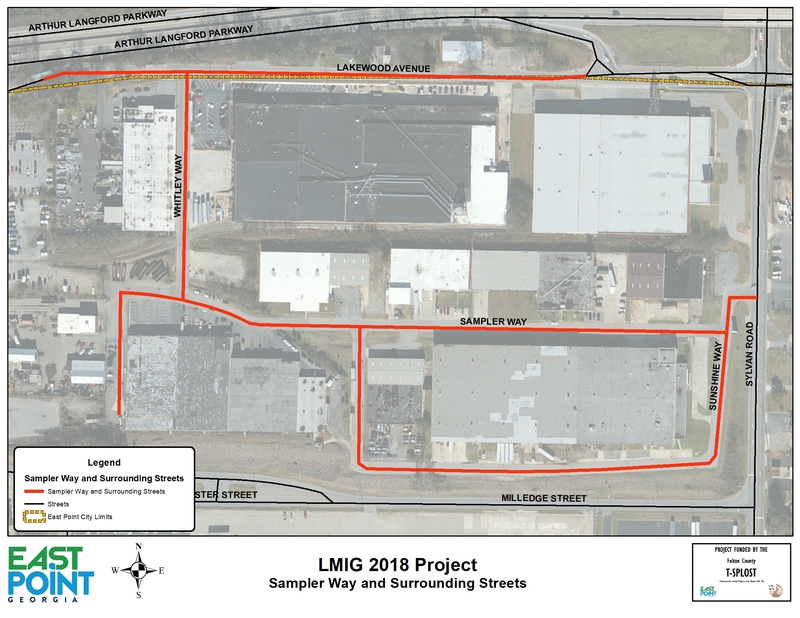 The contract was awarded to Lowe Engineers, LLC. 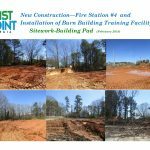 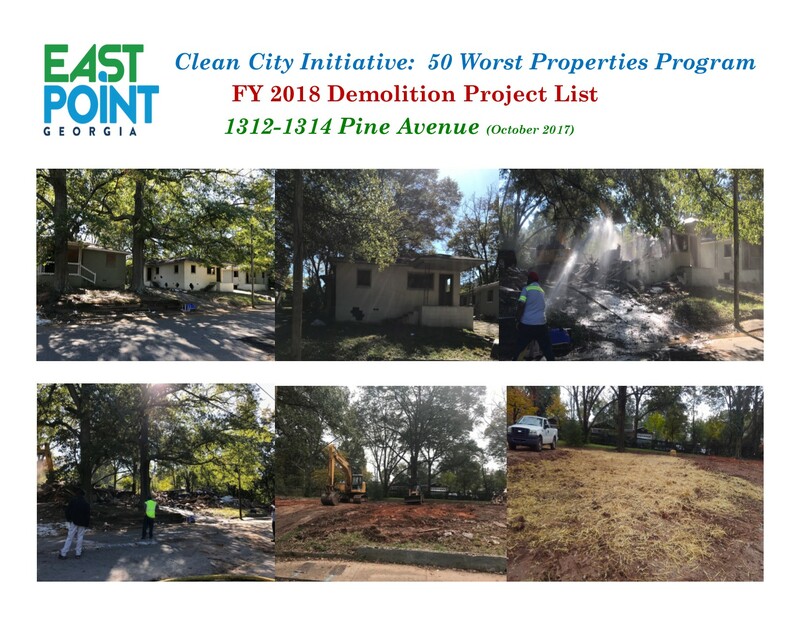 For more information on this project please contact Cadell Hall, Engineer II, at (404) 669-4321 or chall@eastpointcity.org or Vincent Reynolds, Transportation Manager at (404) 270-7114 or vreynolds@eastpointcity.org . 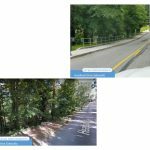 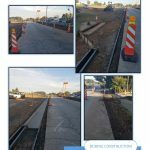 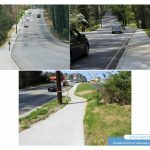 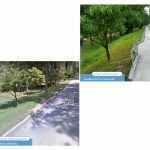 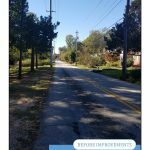 The goal of this project is to provide continuous sidewalks on both sides of Sylvan Road from Cleveland Avenue to Jefferson Avenue. 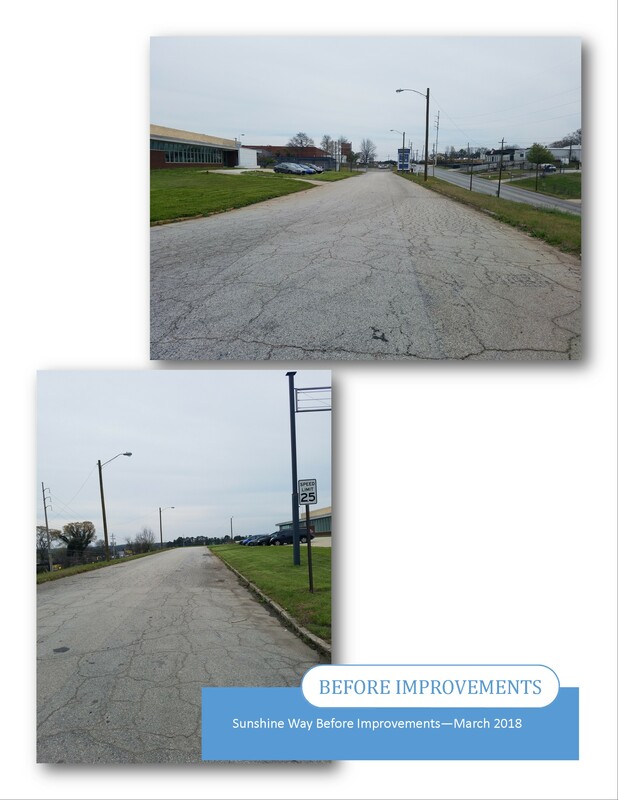 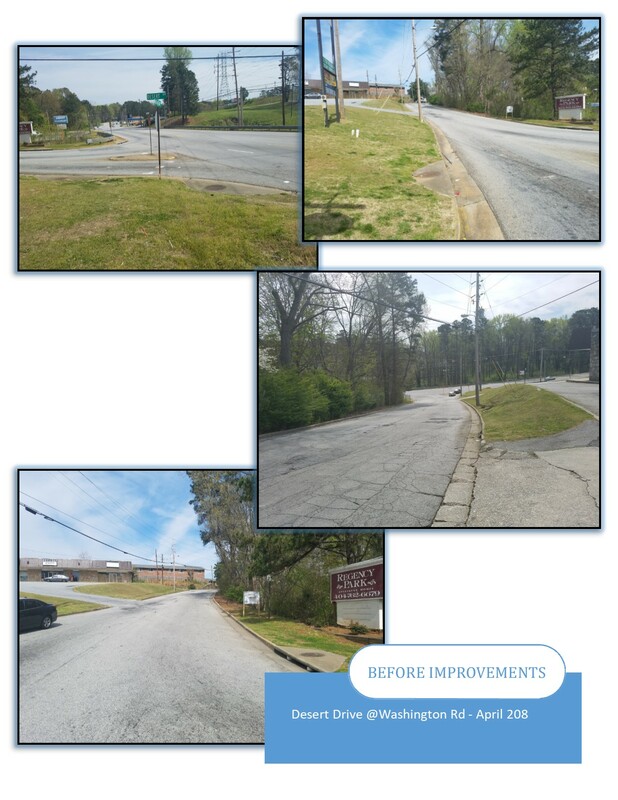 This project will include crosswalks striping, ADA Ramps, and repair of broken sidewalks and curb where needed. 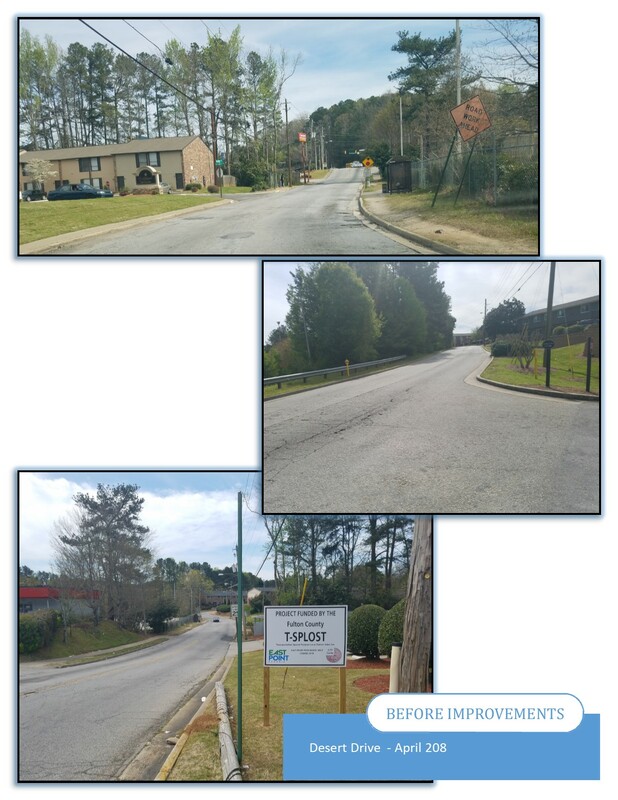 The contract was awarded to DAF Concrete, Inc . For more information on this project please contact Cadell Hall, Engineer II, at (404) 669-4321 or chall@eastpointcity.org or Vincent Reynolds, Transportation Manager at (404) 270-7114 or vreynolds@eastpointcity.org . 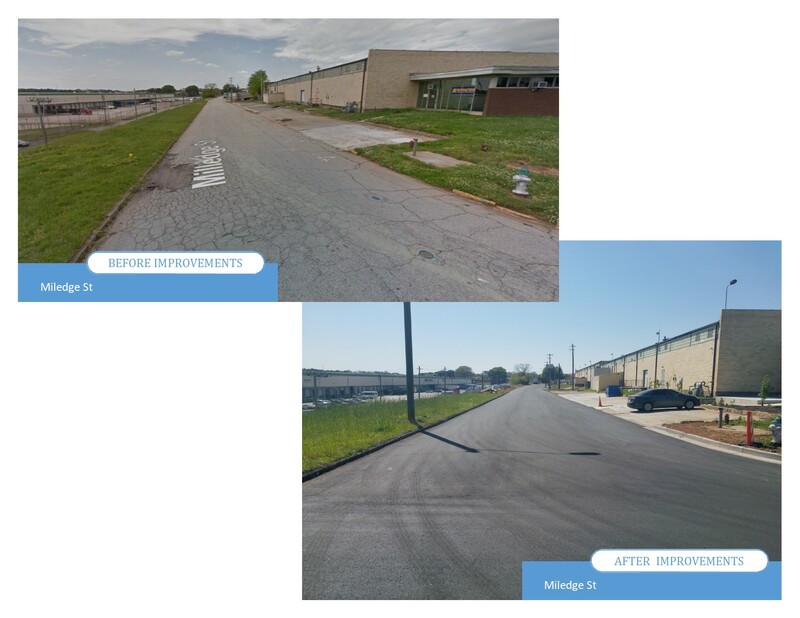 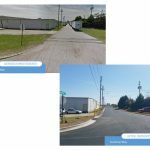 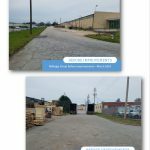 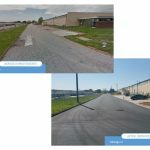 The method of repair will be 2.5 inches of 6 ft wide edge milling, and inlay with 1.0 inch of Perma Pave (Flex) or equivalent asphalt plant mix, and 1.5 inches of 12.5 mm superpave for the entire surface of the pavement. 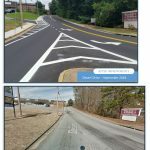 All existing ADA ramps along new pavement will also be upgraded. 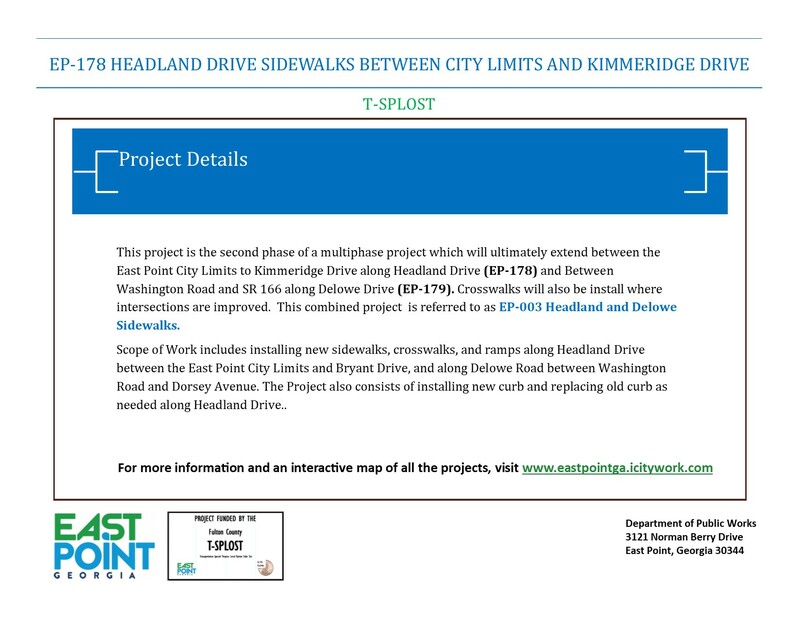 For more information on this project please contact Cadell Hall, Engineer II, at (404) 669-4321 or chall@eastpointcity.org or Vincent Reynolds, Transportation Manager at (404) 270-7114 or vreynolds@eastpointcity.org . 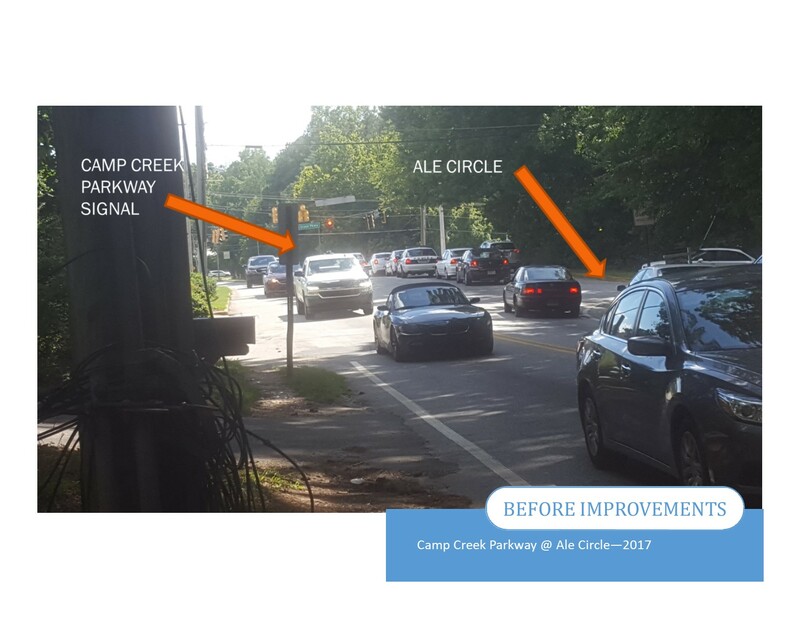 The intersection of Marketplace Boulevard and Shelby Lane at the Camp Creek Marketplace shopping center featured a two-way stop, but it was misinterpreted by drivers, causing vehicles to back up on the Camp Creek Parkway. 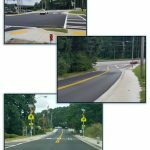 This creates dangerous conditions both at the intersection and out on the highway. 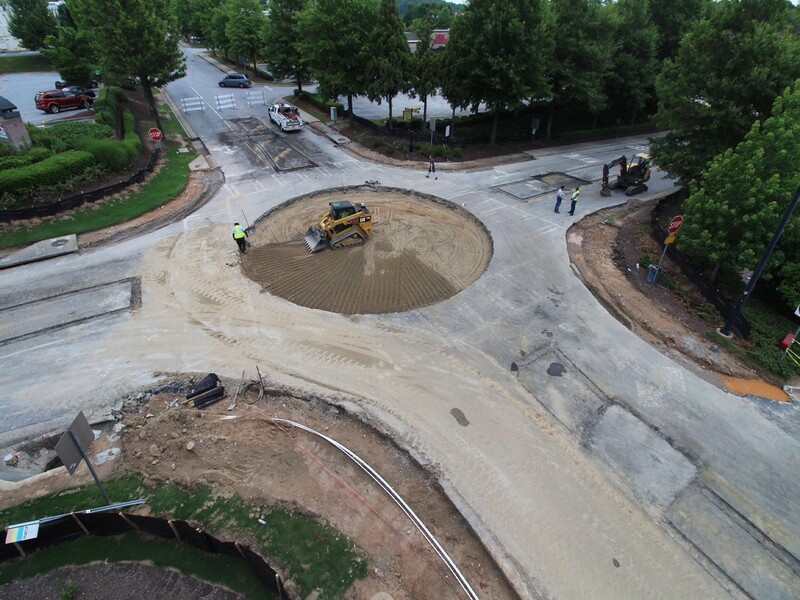 To improve the flow of traffic, the Aerotropolis Atlanta CID is partnering with the City of East Point to construct a miniature roundabout. 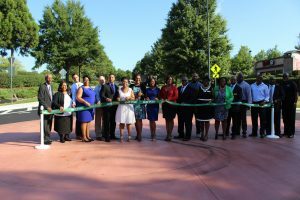 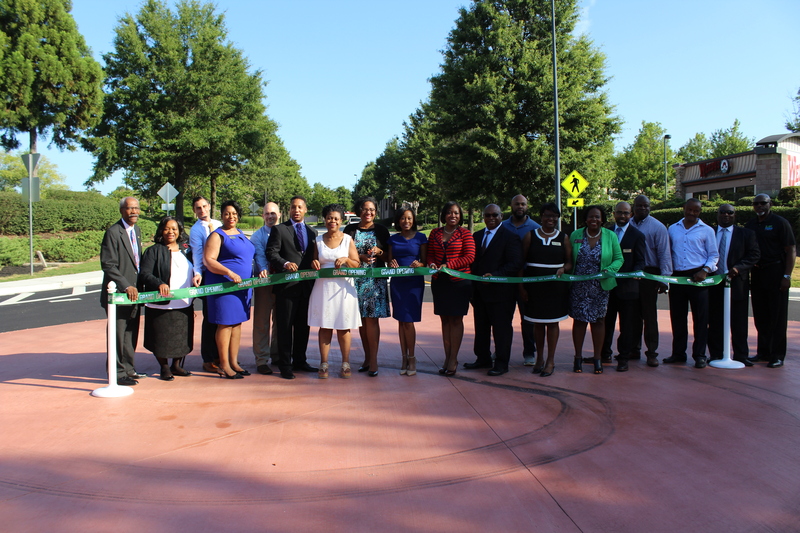 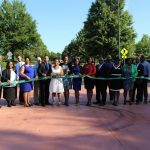 On August 6, the City of East Point in partnership with the Aerotropolis Atlanta CIDs hosted a ribbon cutting ceremony for the Camp Creek Marketplace Roundabout located at Marketplace Blvd and Shelby Lane. 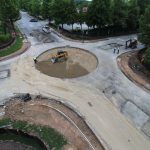 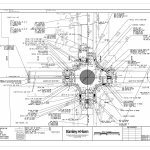 Design of the roundabout began June 2017 through March 2018 with a design cost of $51,000. 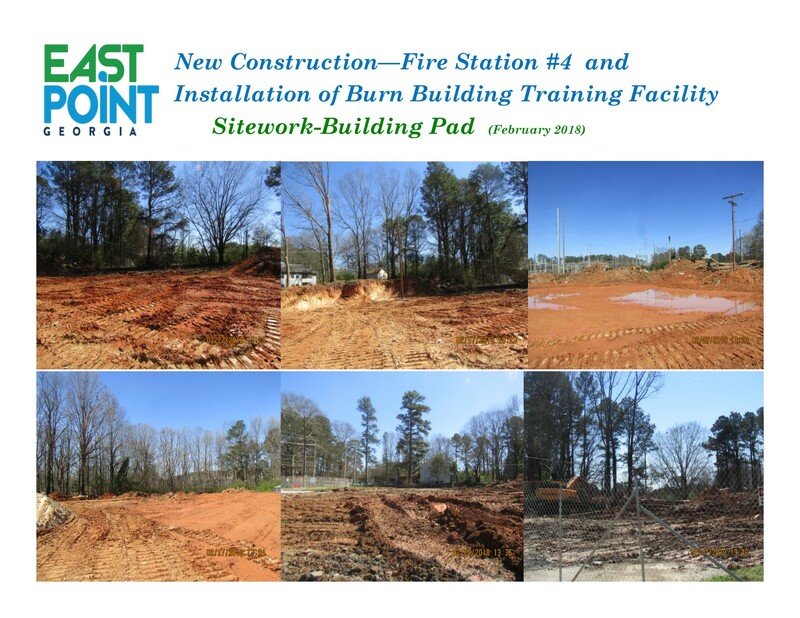 Construction began on June 18, 2018 and is scheduled to be complete on August 1, 2018. 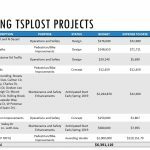 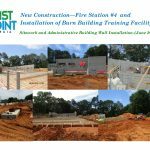 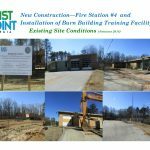 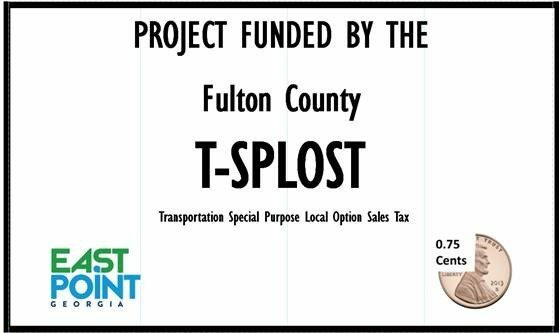 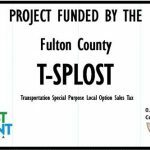 The cost of construction was split in half between the Aerotropolis Atlanta CIDs and the City of East Point for a total of $359,540. 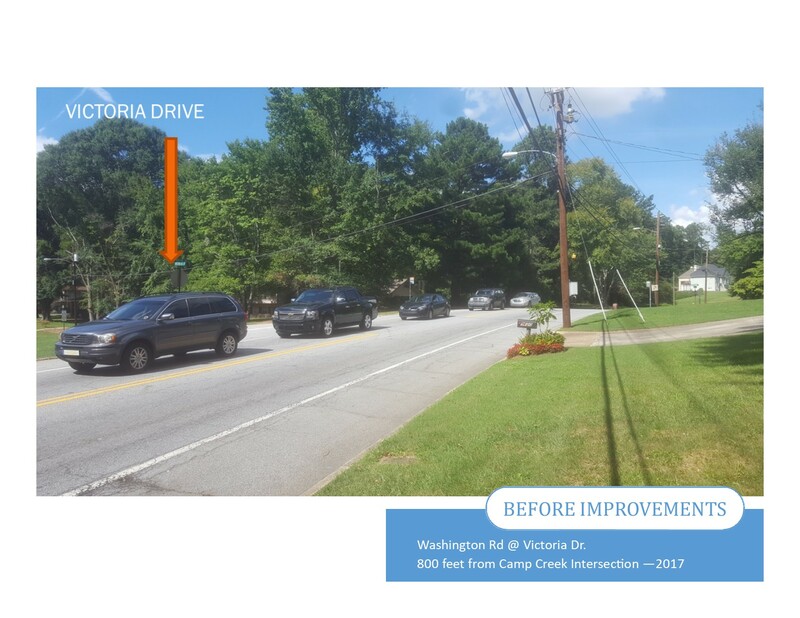 This project consists of installing 6ft wide sidewalks between Washington Road and Camp Creek Parkway. 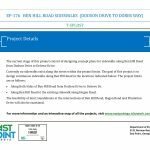 The project also consists of milling of existing asphalt to a depth of two and one half (2.5) inches and overlaying two and one half (2.5) inches of new pavement material along Desert Drive. 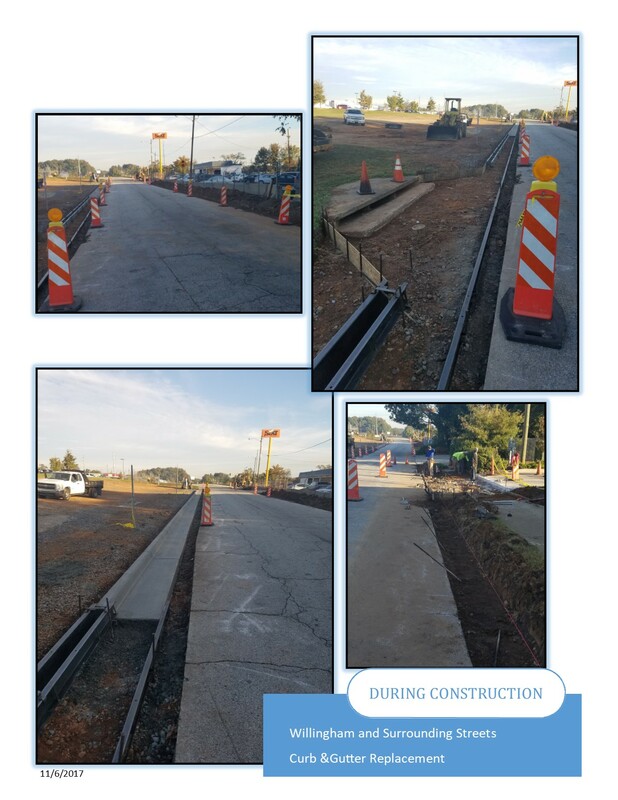 The existing curb line will be shifted to allow installations of sidewalks within the existing right of way. 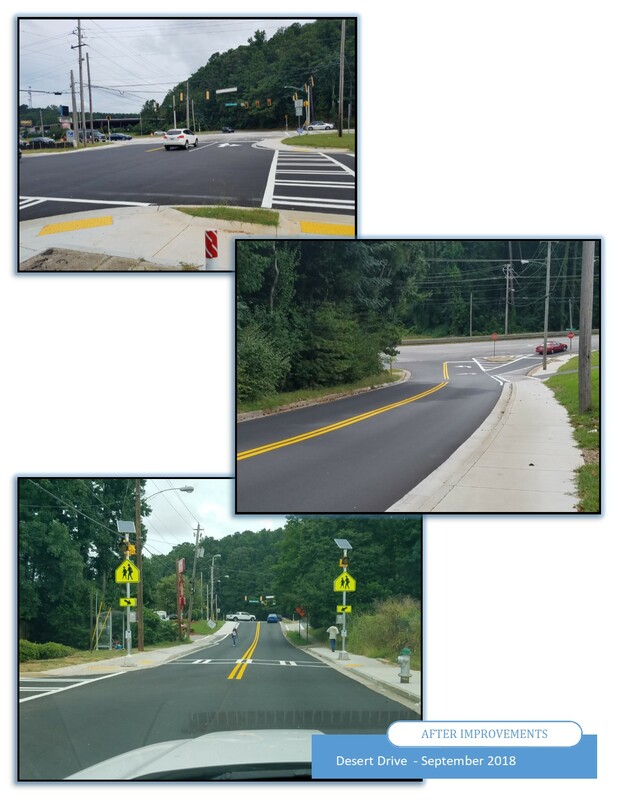 In addition, Pedestrian Crossing Signs and Rectangular Rapid Flashing Beacons (RRFB) Push-button Activated Crosswalk System be installed at the proposed mid-block crosswalk near Kenelworth Drive. 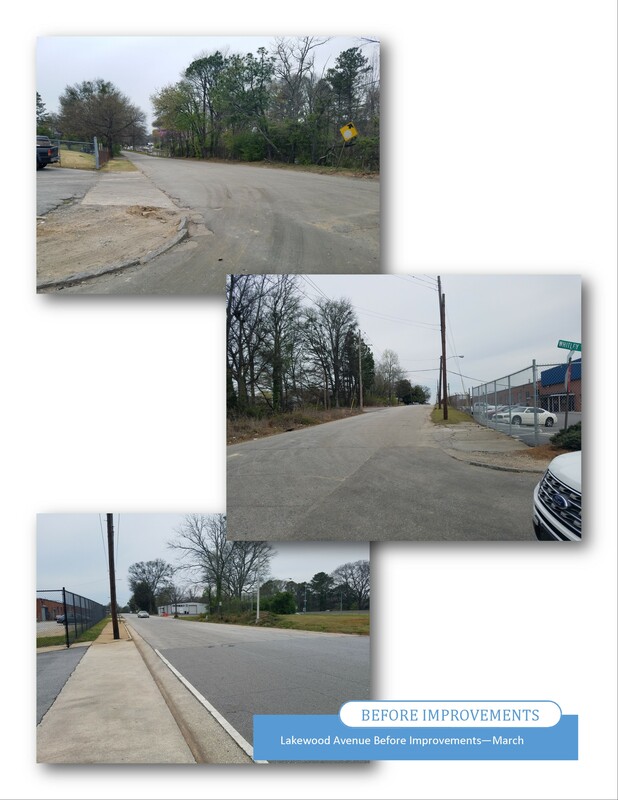 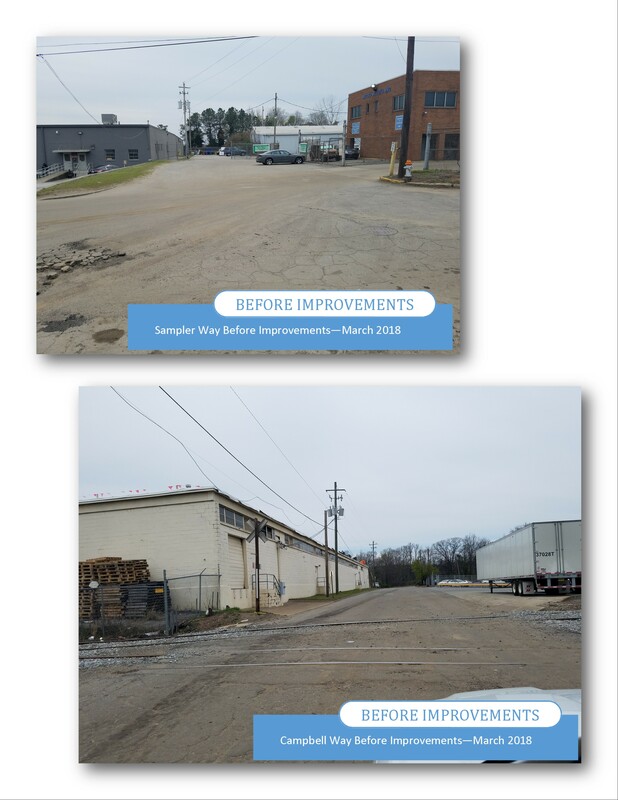 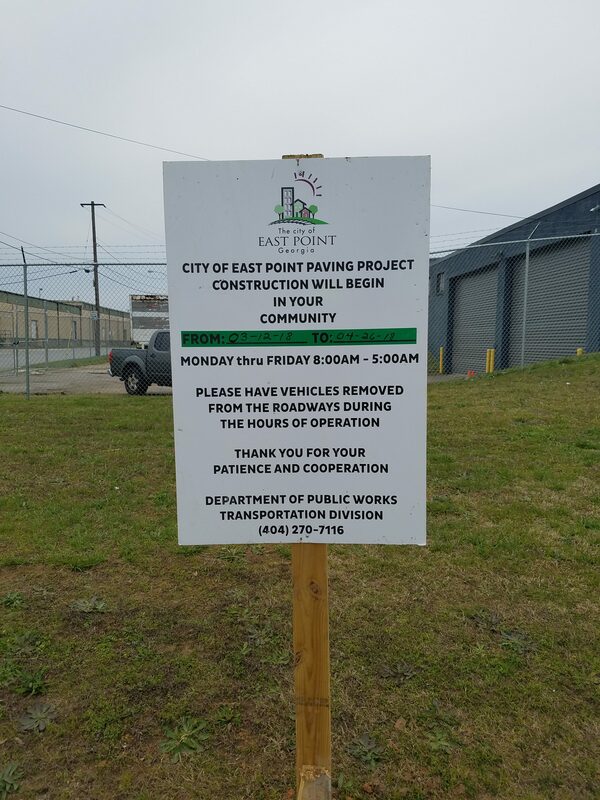 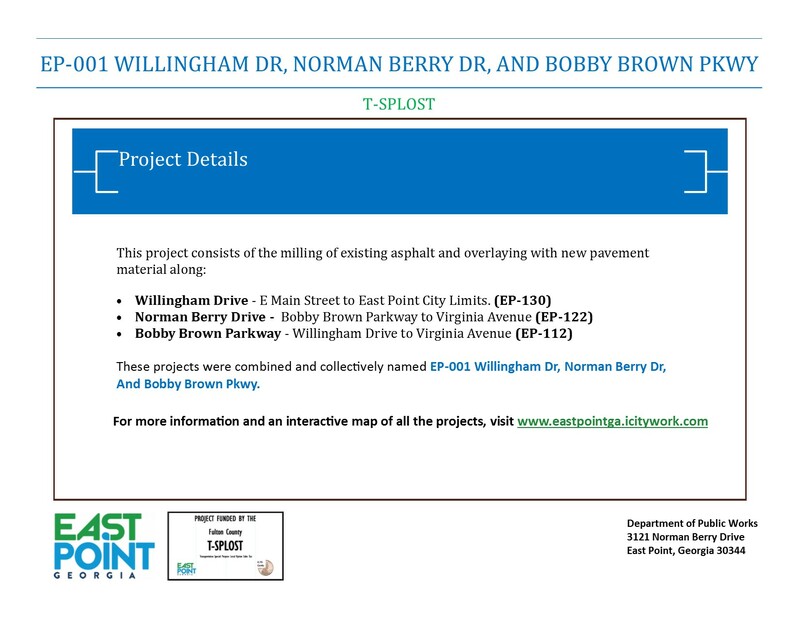 The contract was awarded to Mullins Bros Paving Contractors Inc. For more information on this project please contact Cadell Hall, Engineer II, at (404) 669-4321 or chall@eastpointcity.org or Vincent Reynolds, Transportation Manager at (404) 270-7114 or vreynolds@eastpointcity.org . 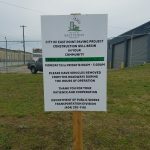 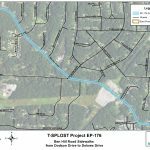 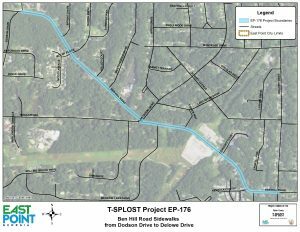 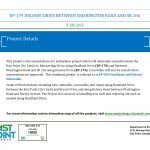 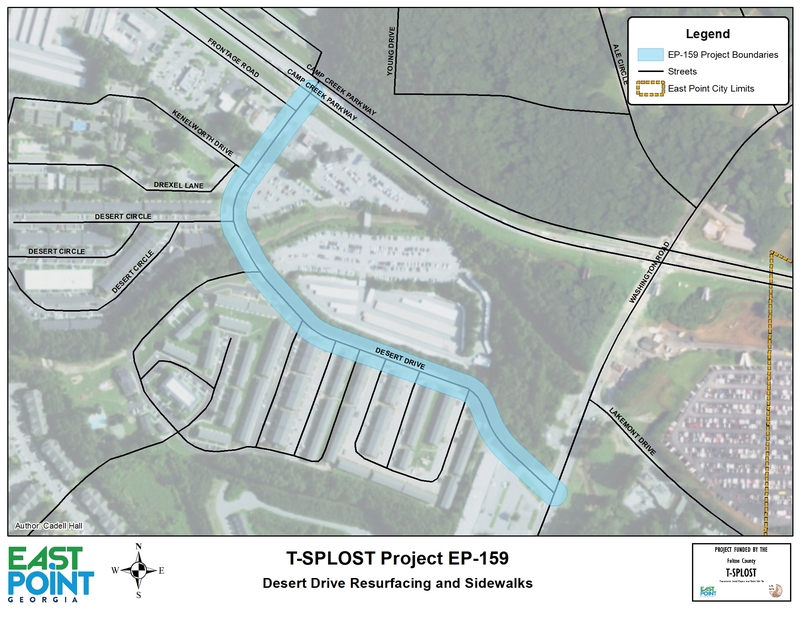 This project is the second phase of a multi-phase project which will ultimately extend between the East Point City Limits to Kimmeridge Drive along Headland Drive (EP-178) and Between Washington Road and SR 166 along Delowe Drive (EP-179). 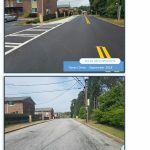 Crosswalks will also be install where intersections are improved. 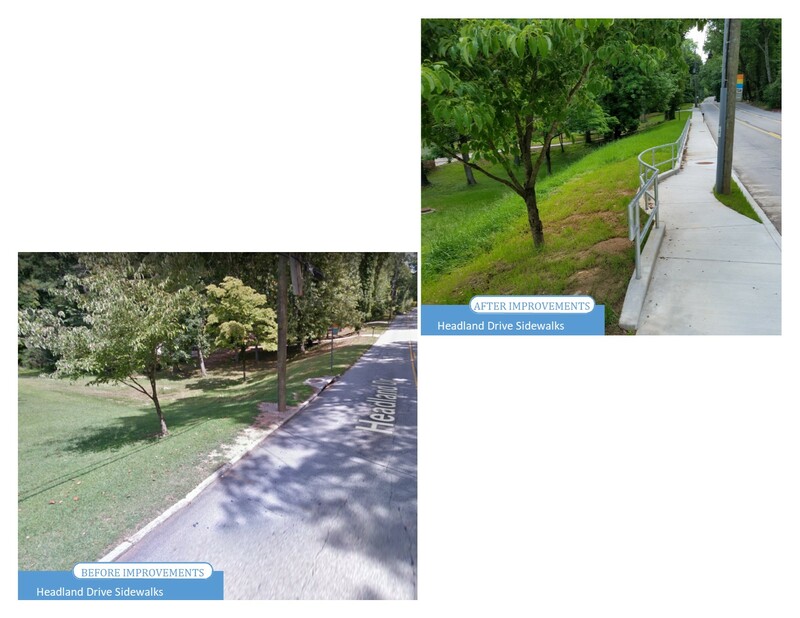 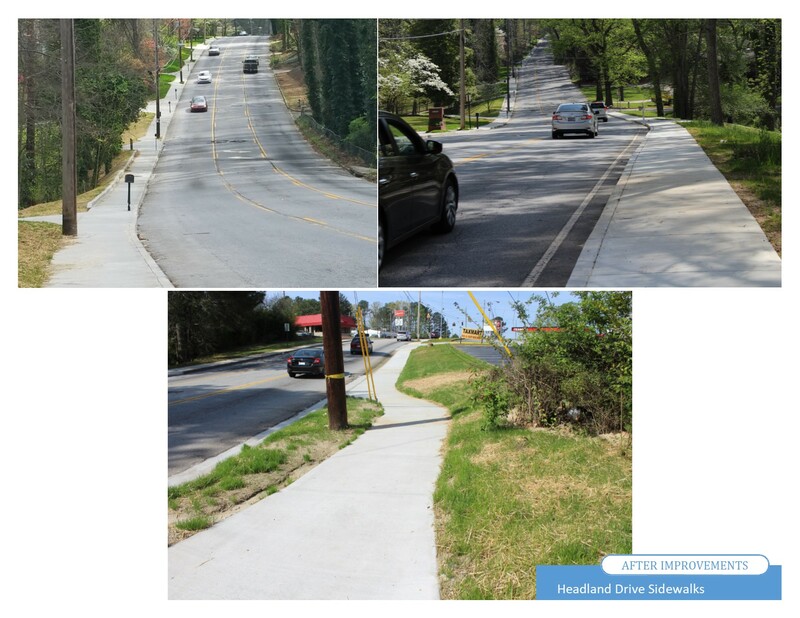 This combined project is referred to as EP-003 Headland Dr and Delowe Dr Sidewalks. 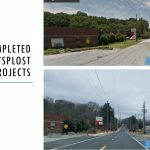 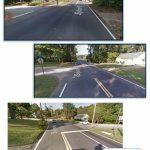 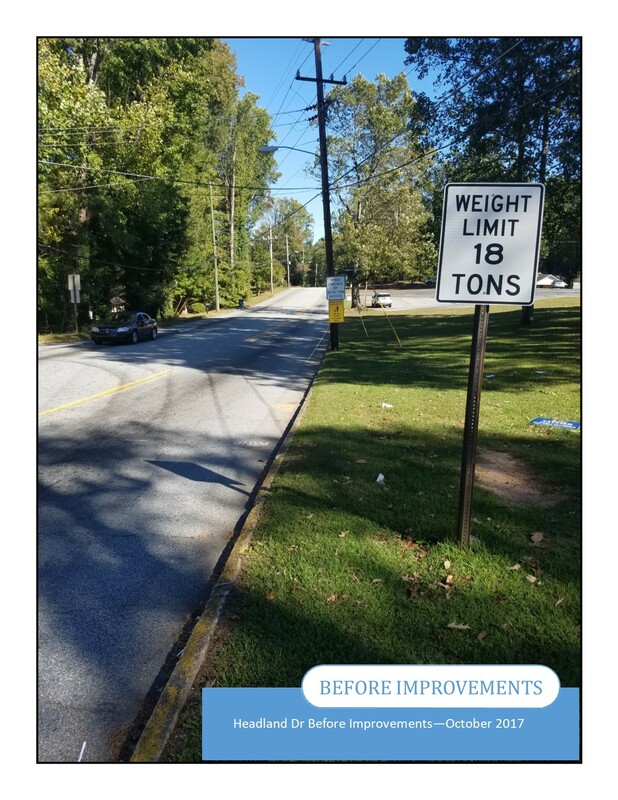 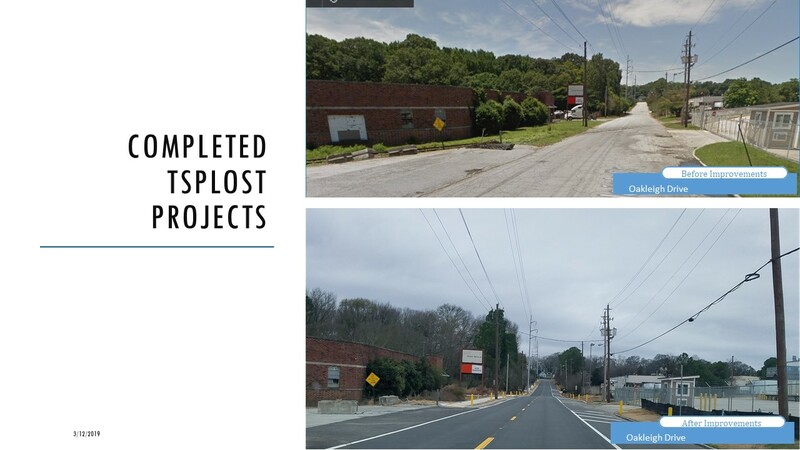 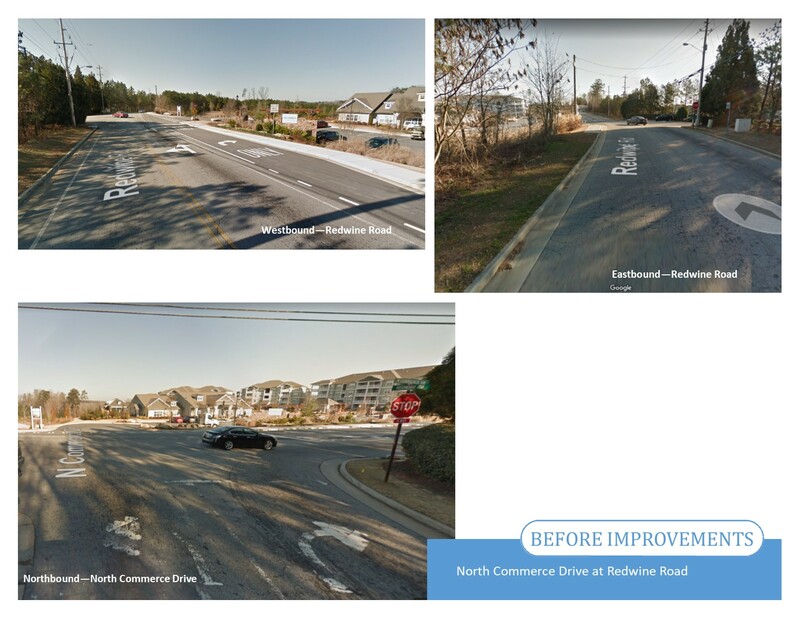 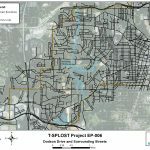 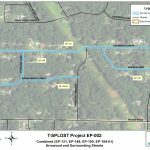 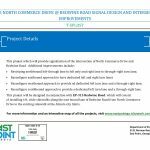 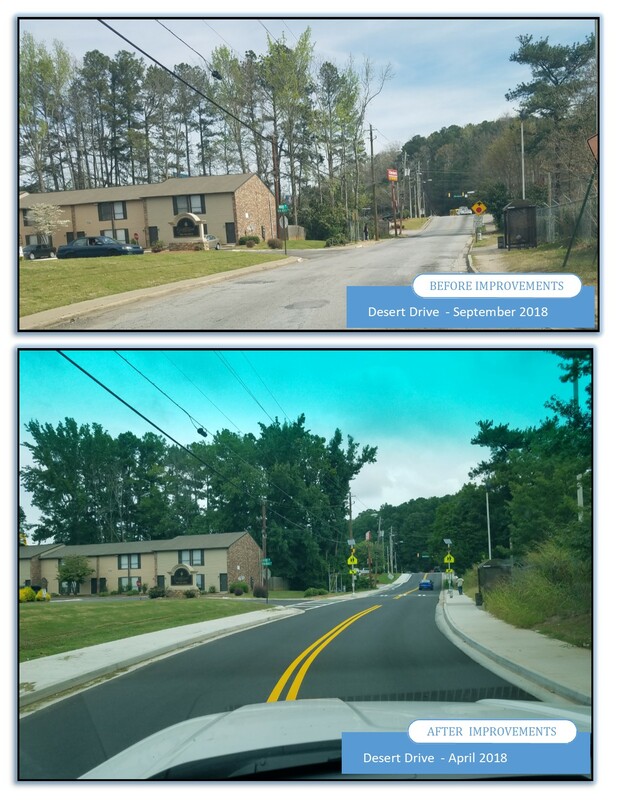 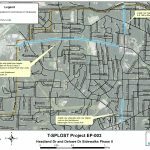 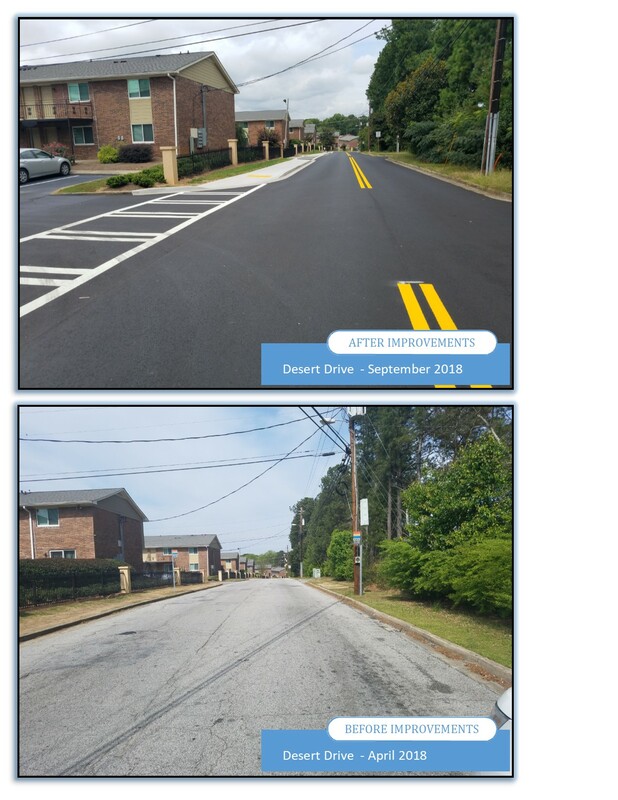 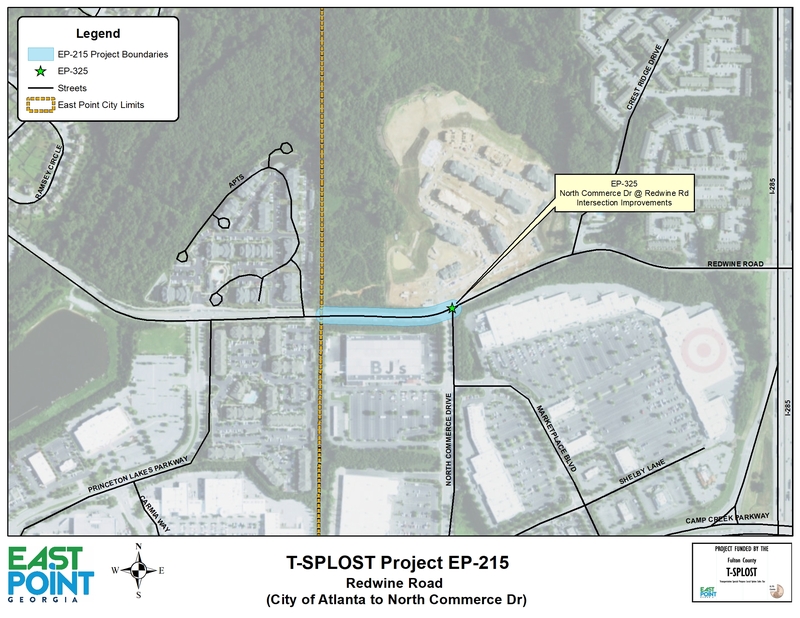 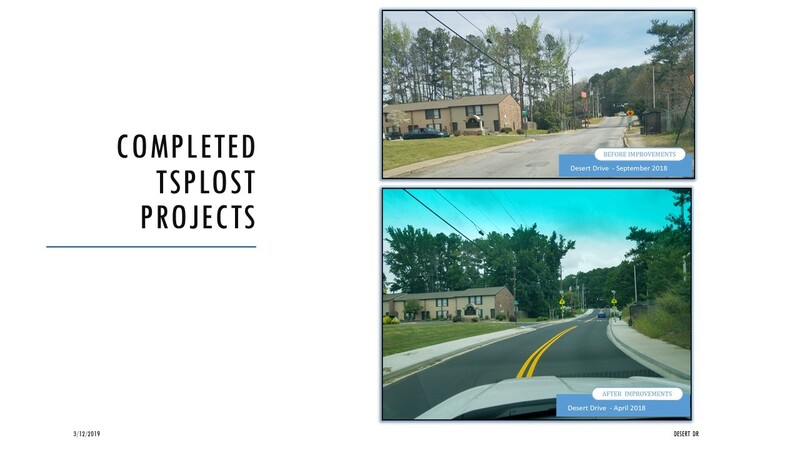 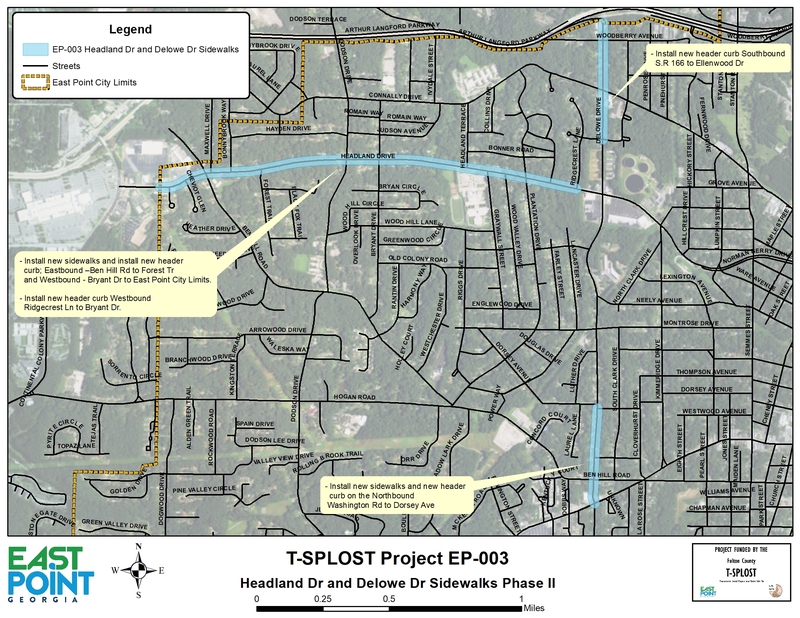 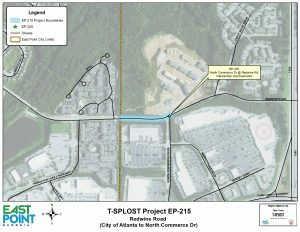 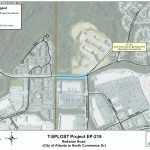 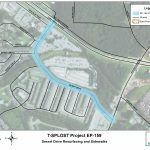 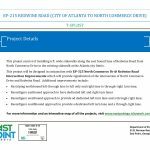 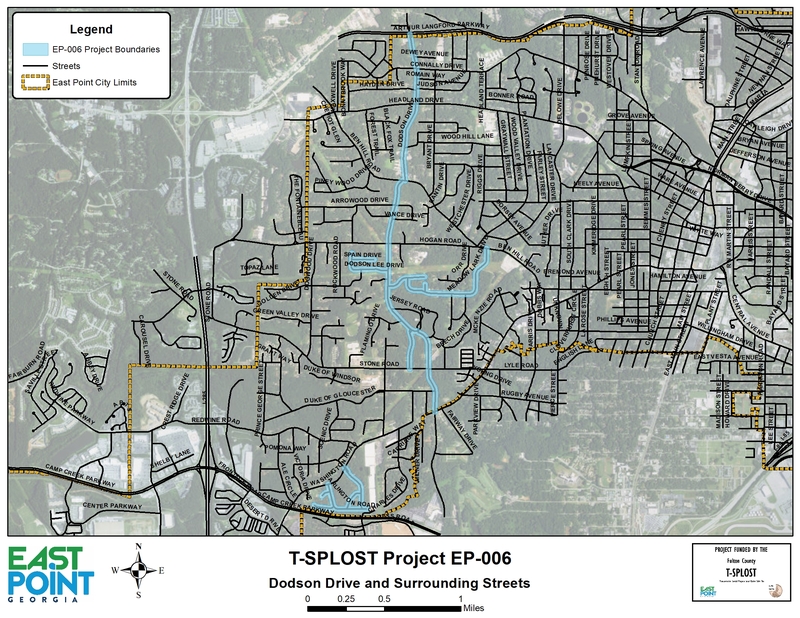 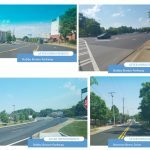 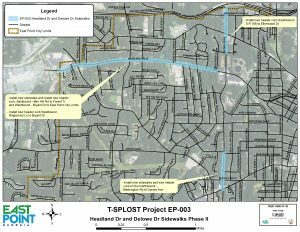 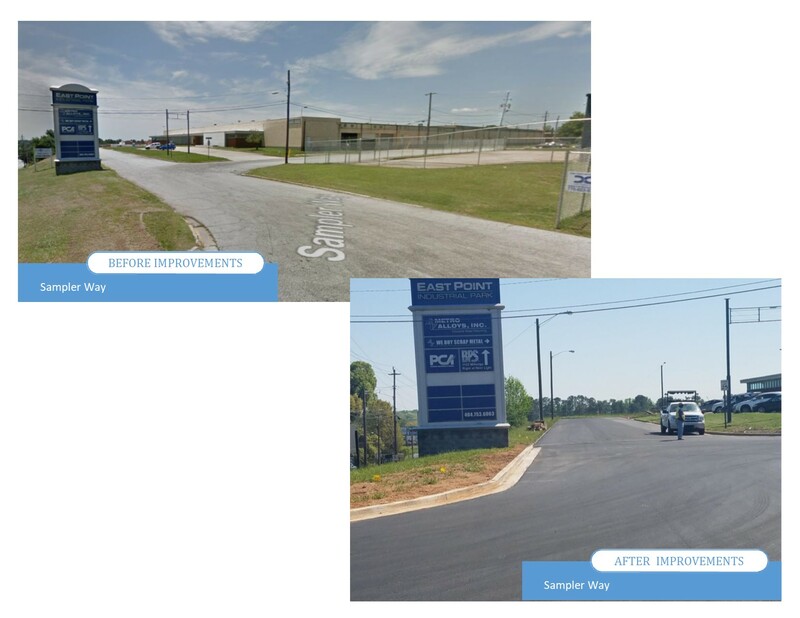 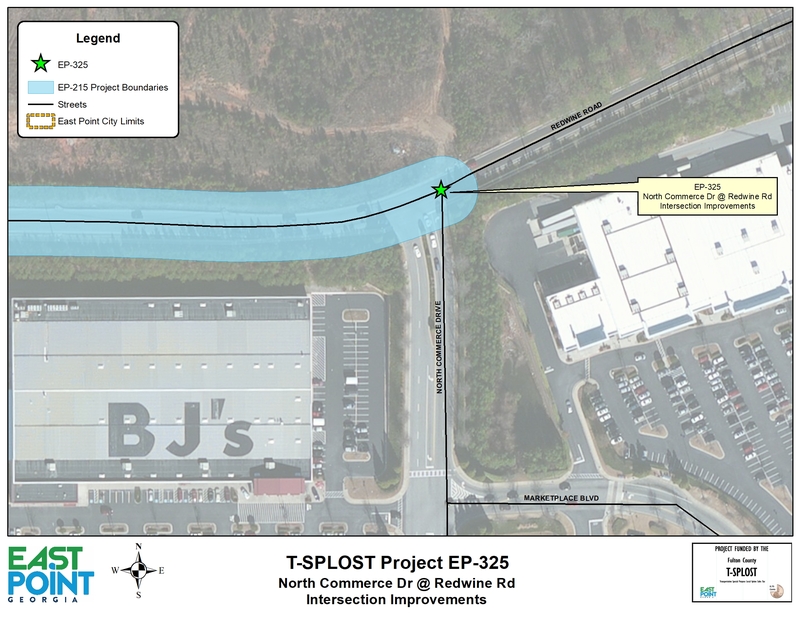 Scope of Work includes installing new sidewalks, crosswalks, and ramps along Headland Drive between the East Point City Limits and Bryant Drive, and along Delowe Drive between Washington Road and Dorsey Avenue. 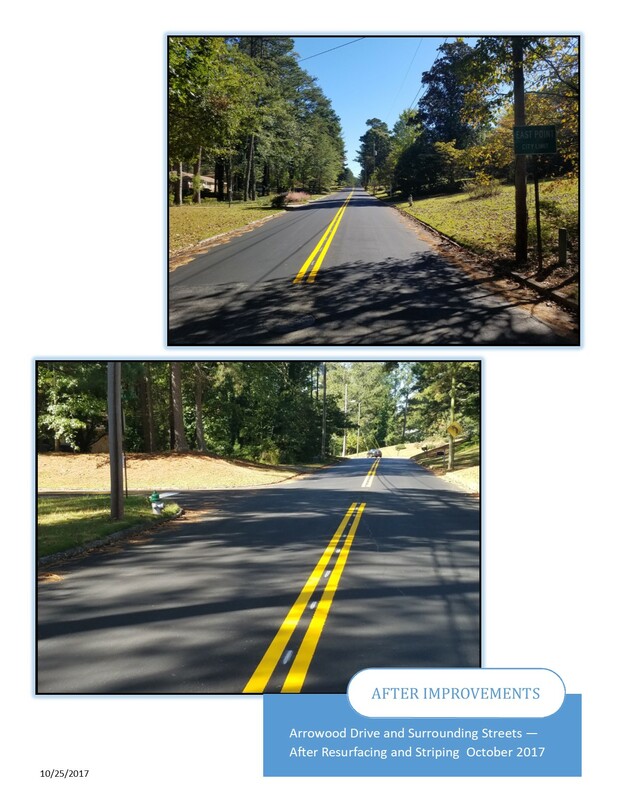 The Project also consists of installing new curb and replacing old curb as needed along Headland Drive. 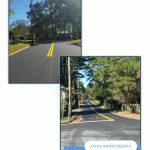 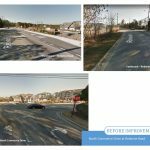 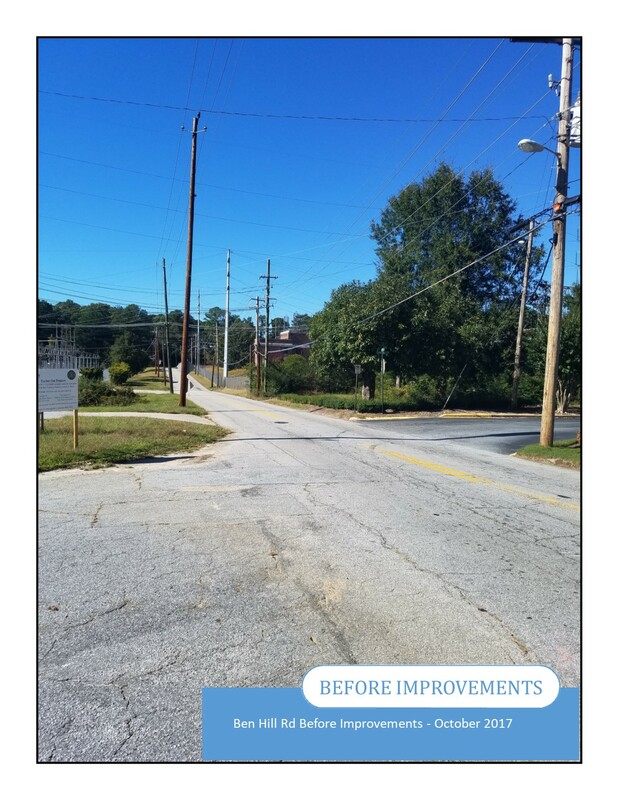 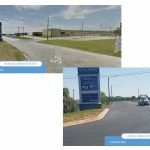 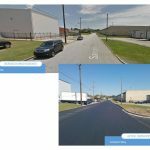 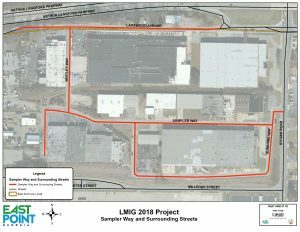 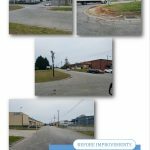 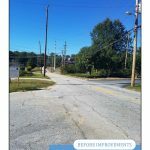 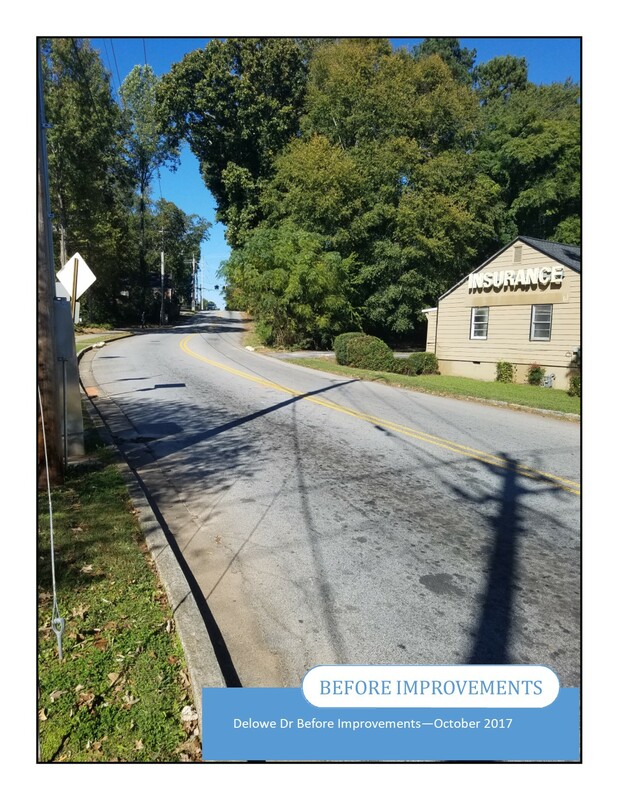 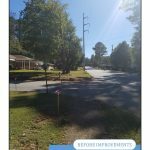 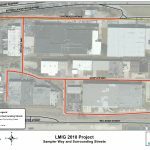 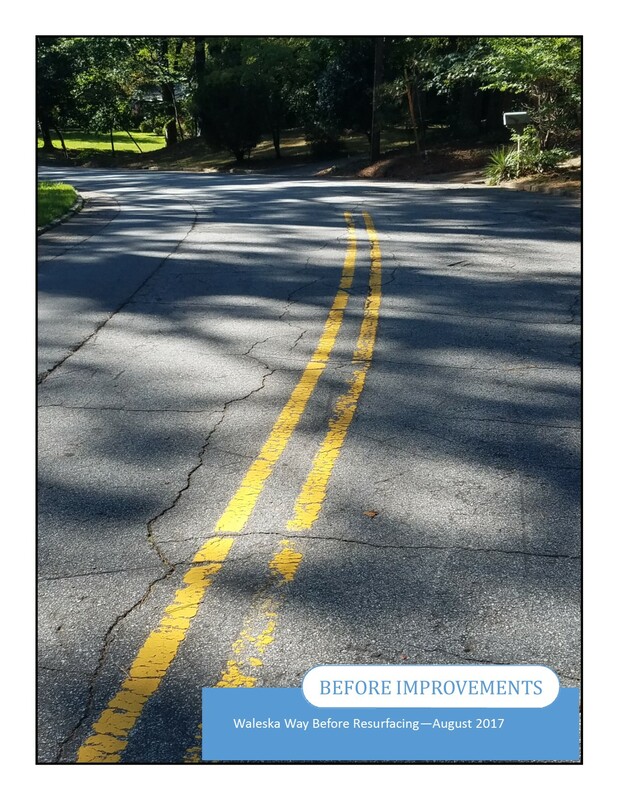 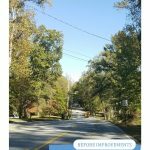 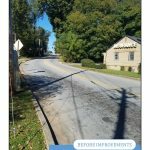 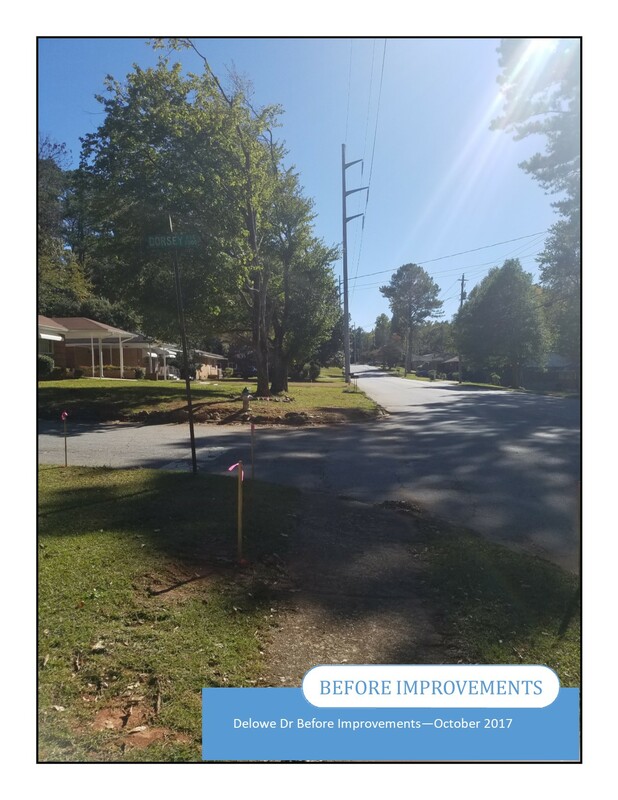 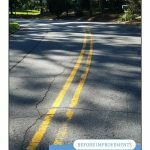 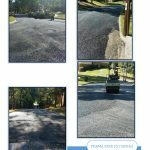 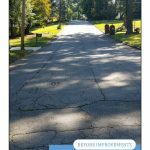 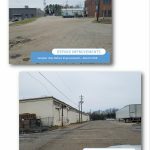 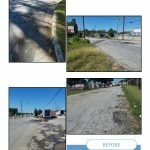 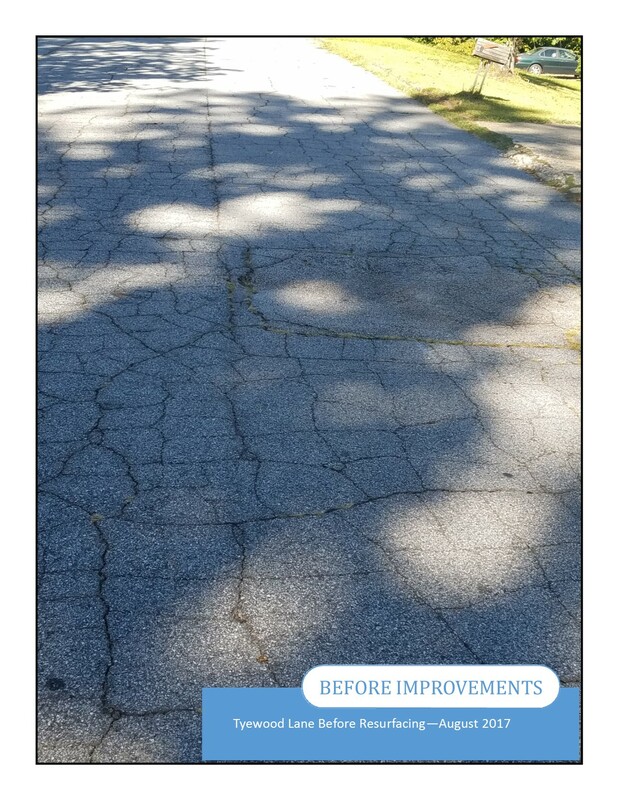 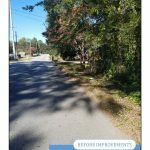 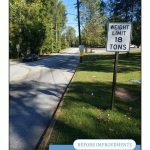 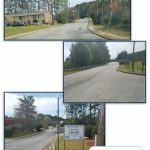 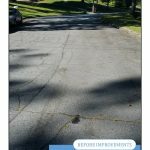 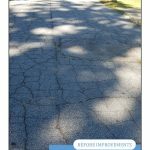 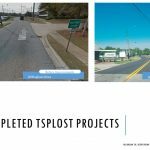 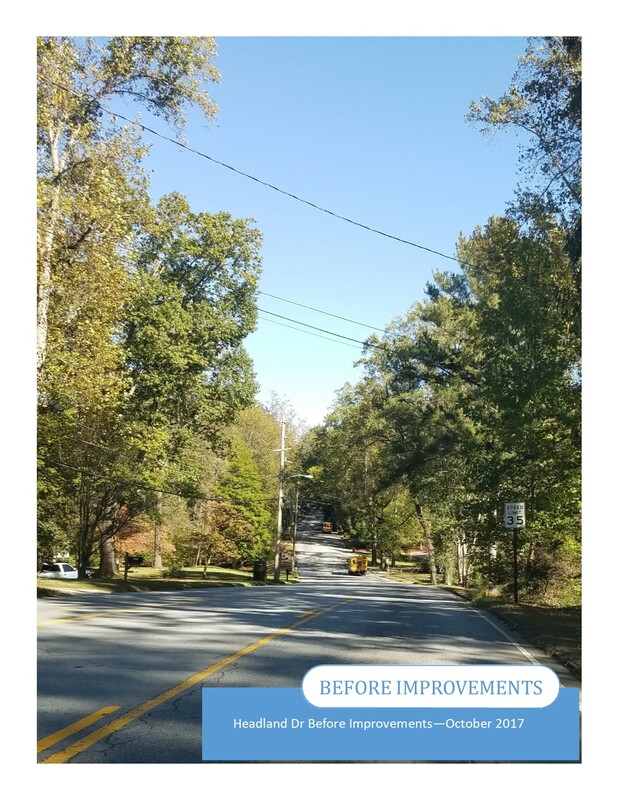 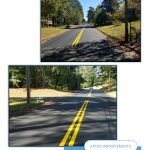 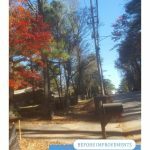 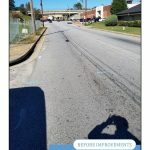 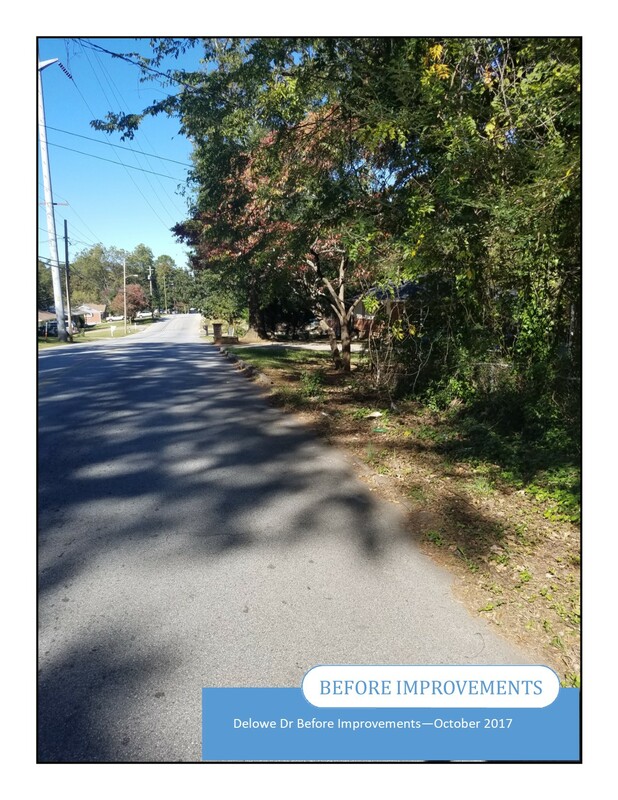 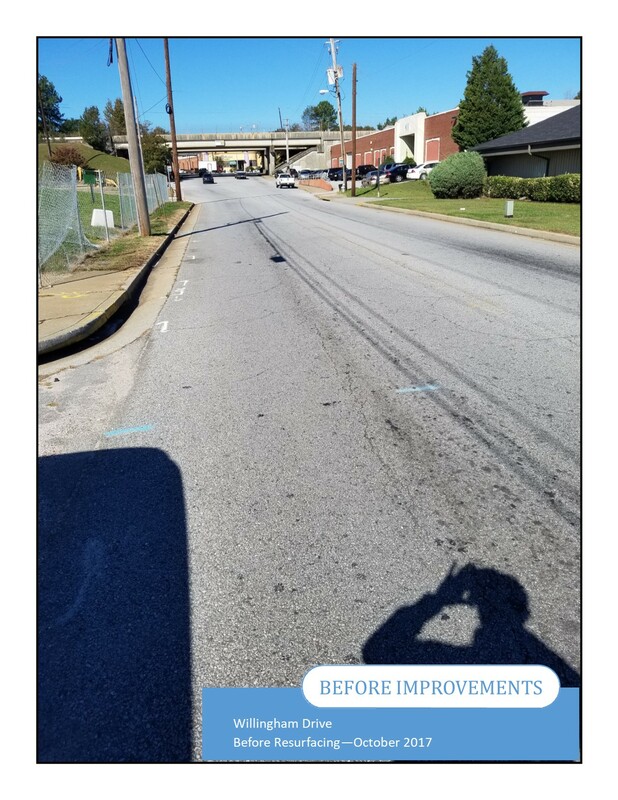 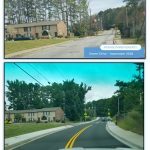 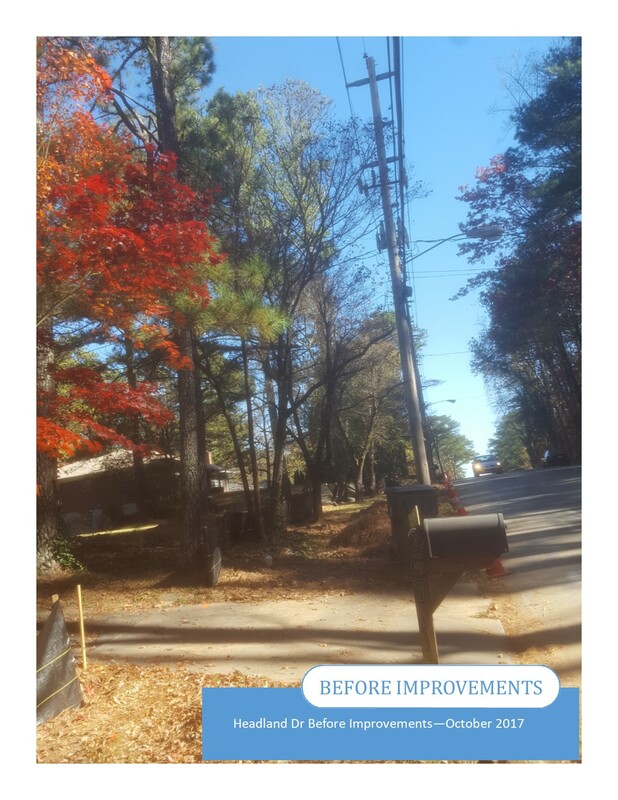 Each year the Georgia Department of Transportation (GDOT) notifies all local governments of the upcoming “Local Maintenance Improvement Grant” (LMIG) program, if funding is made available. 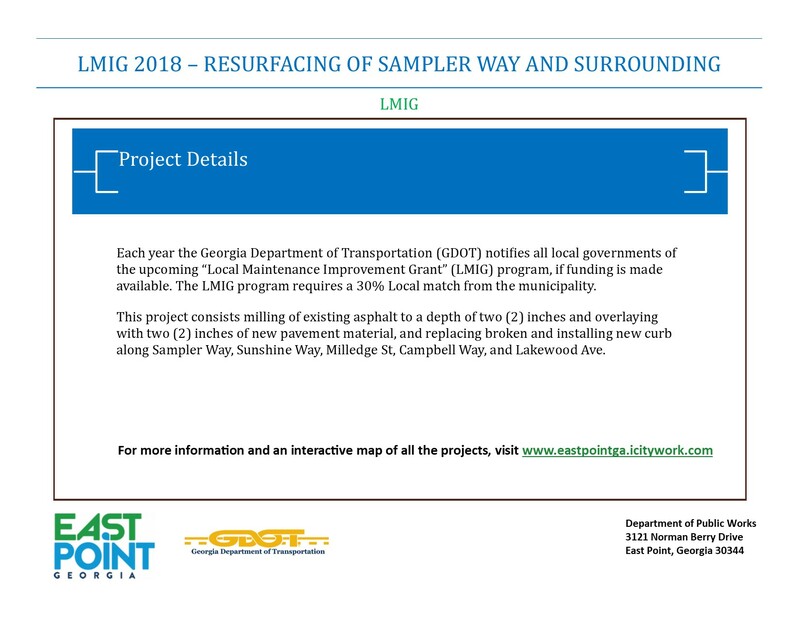 The LMIG program requires a 30% Local match from the municipality. 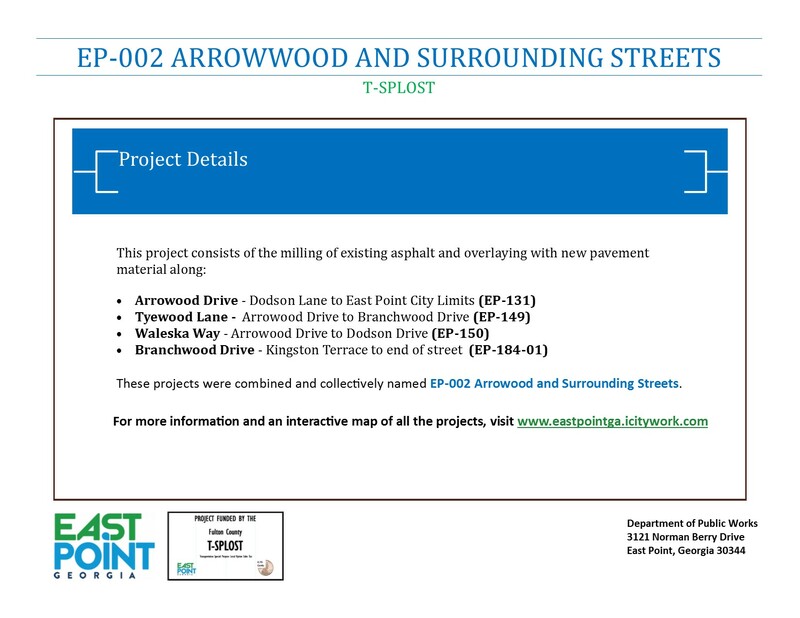 In brief, the Scope of Work consists milling of existing asphalt to a depth of two (2) inches and overlaying with two (2) inches of new pavement material, and replacing broken and installing new curb along Sampler Way, Sunshine Way, Milledge St, Campbell Way, and Lakewood Ave. This project is the second phase of a multi-phase project which will ultimately extend between the East Point City Limits to Kimmeridge Drive along Headland Drive (EP-178) and Between Washington Road and SR 166 along Delowe Drive (EP-179). 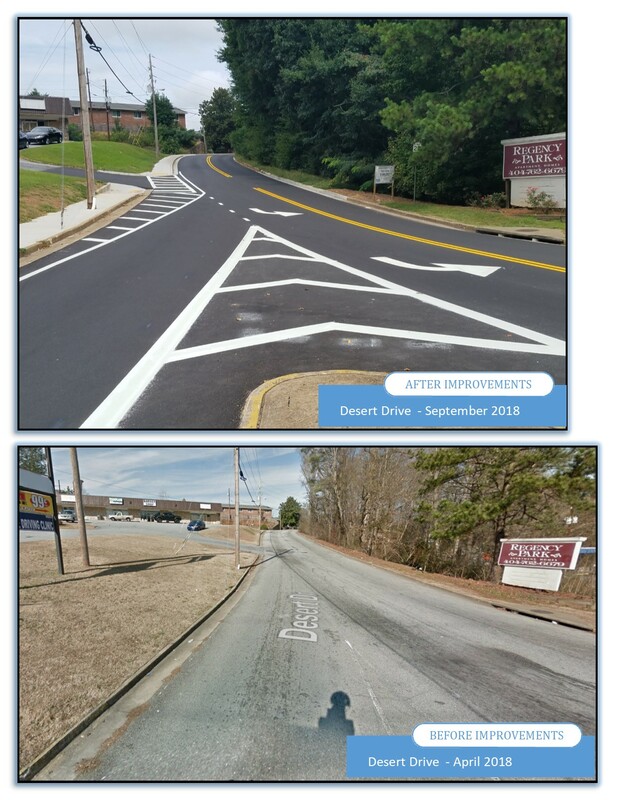 Crosswalks will also be install where intersections are improved. 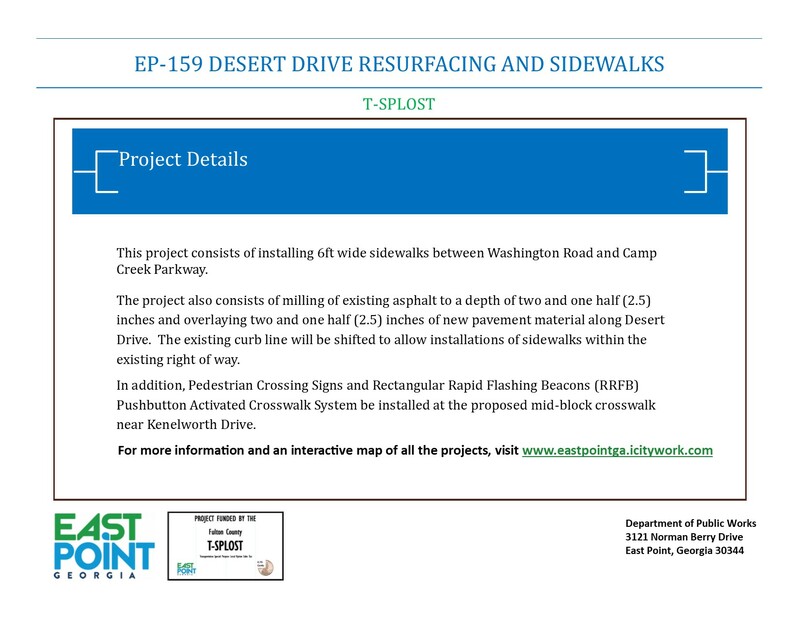 This combined project is referred to as EP-003 Headland and Delowe Sidewalks. 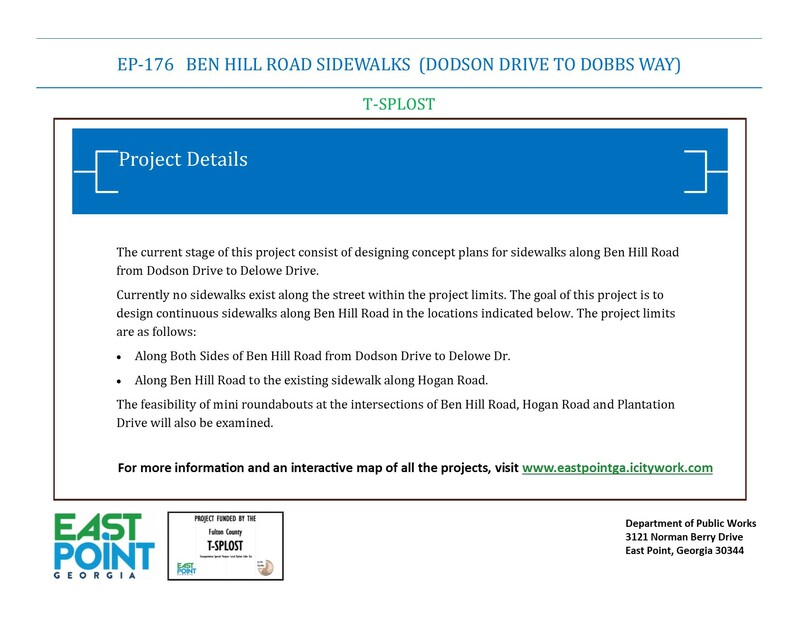 The current stage of this project consist of designing concept plans for sidewalks along Ben Hill Road from Dodson Drive to Delowe Drive. 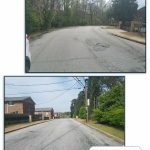 Along Both Sides of Ben Hill Road from Dodson Drive to Delowe Dr. 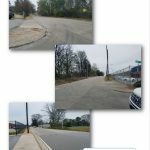 Along Ben Hill Road to the existing sidewalk along Hogan Road. 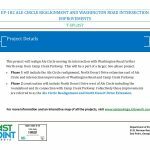 The feasibility of mini roundabouts at the intersections of Ben Hill Road, Hogan Road and Plantation Drive will also be examined. 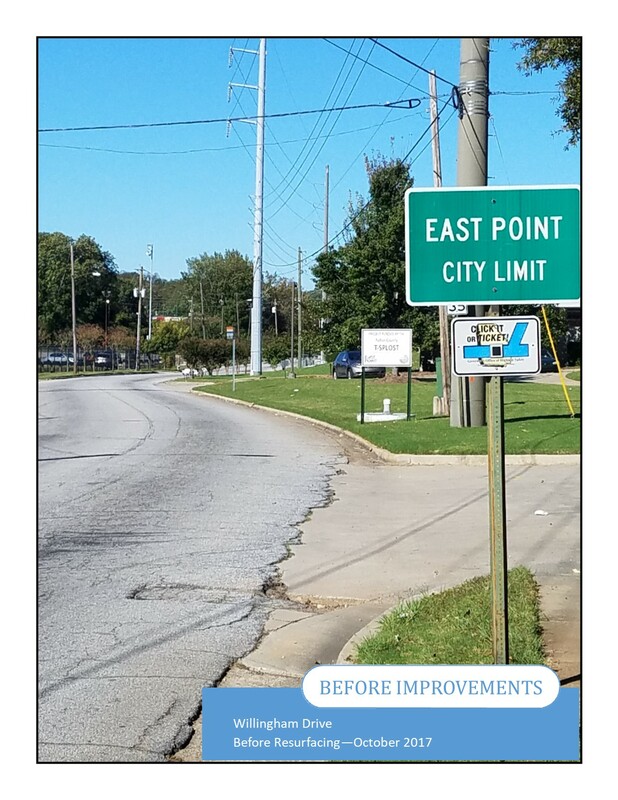 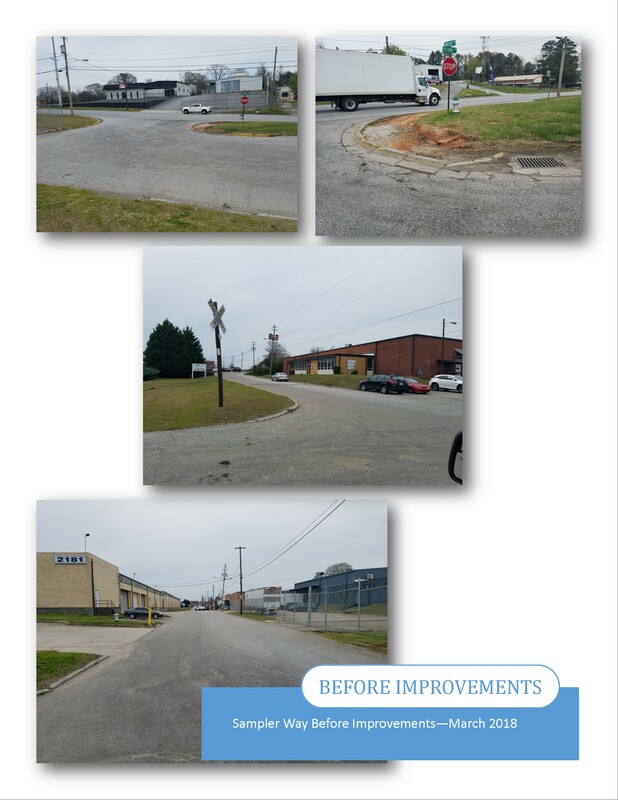 The contract was awarded to Prime Engineering, Inc. For more information on this project please contact Cadell Hall, Engineer II, at (404) 669-4321 or chall@eastpointcity.org or Vincent Reynolds, Transportation Manager at (404) 270-7114 or vreynolds@eastpointcity.org . 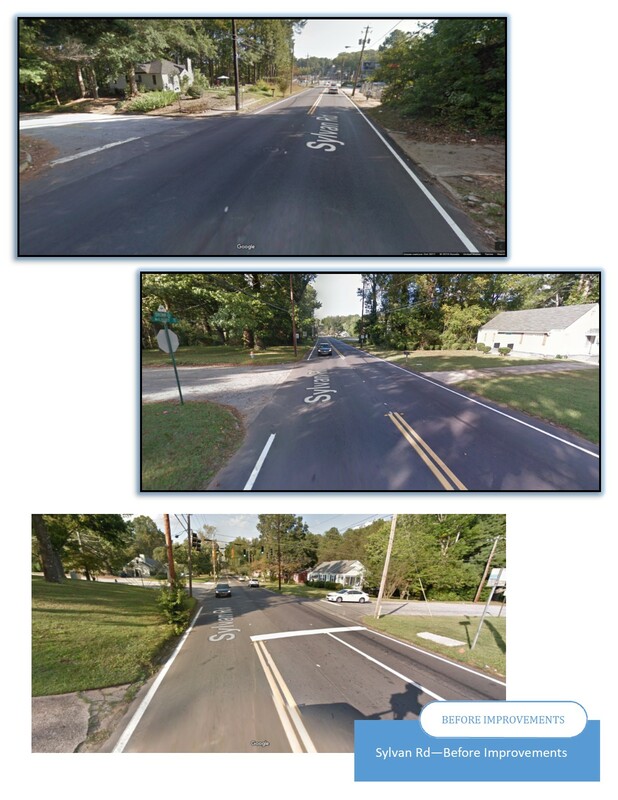 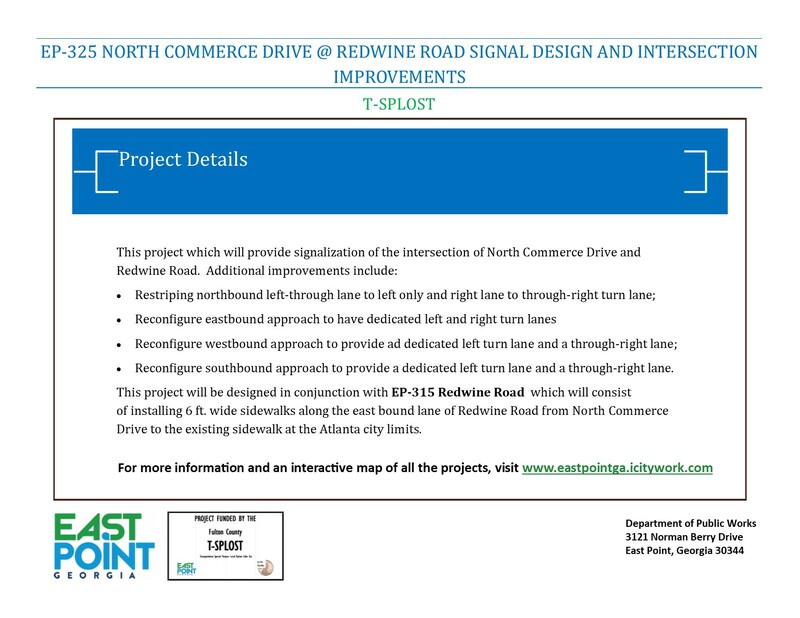 Reconfigure southbound approach to provide a dedicated left turn lane and a through‐right lane. 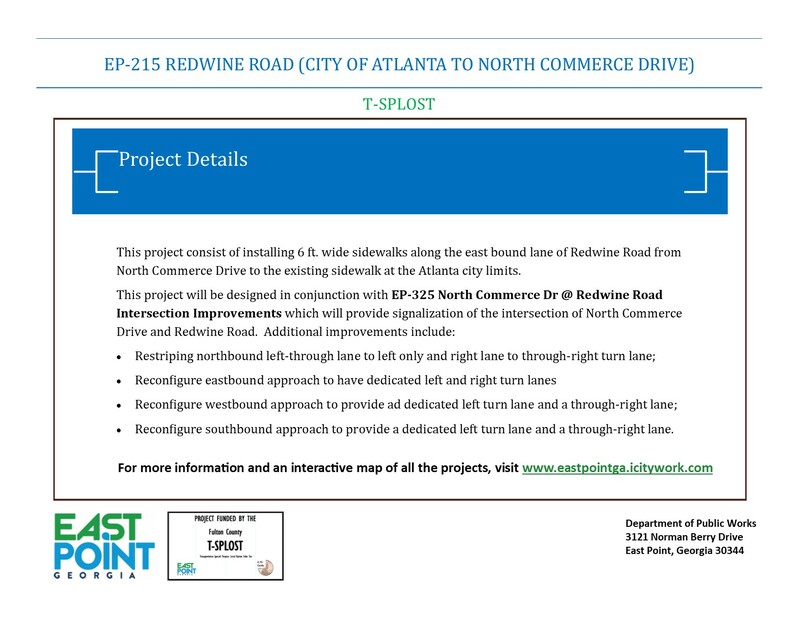 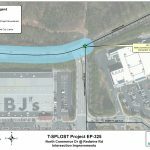 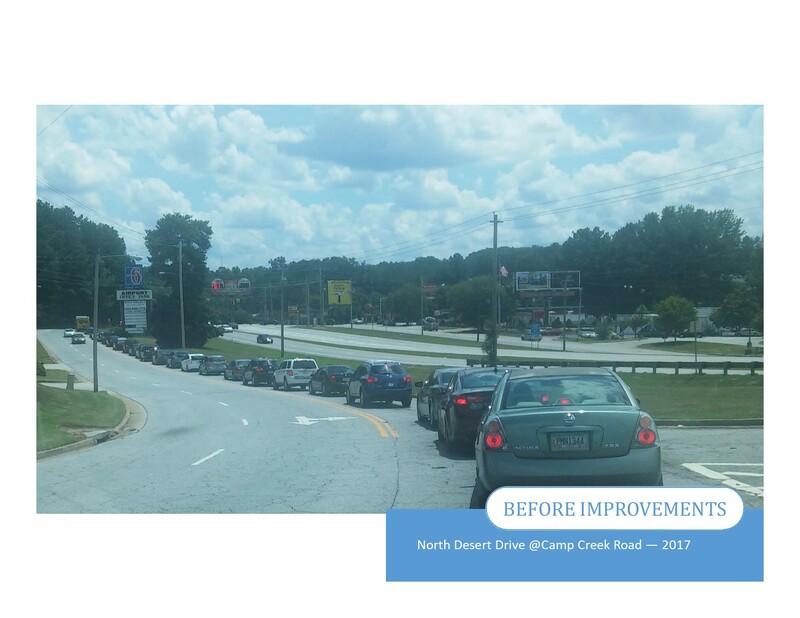 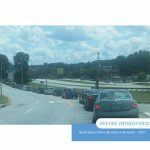 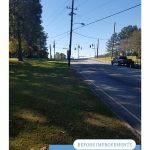 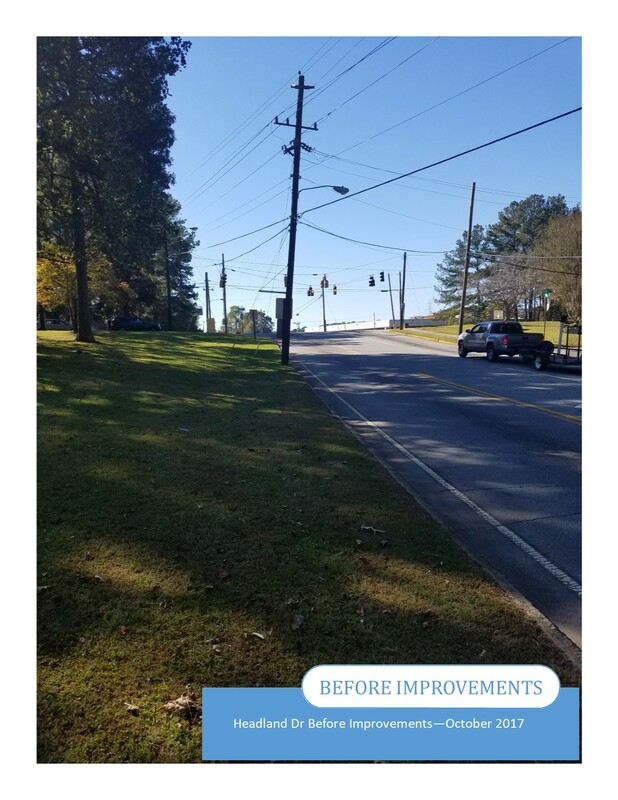 This project will also consist of installing 6 ft. wide sidewalks along the east bound lane of Redwine Road from North Commerce Drive to the existing sidewalk at the Atlanta city limits. 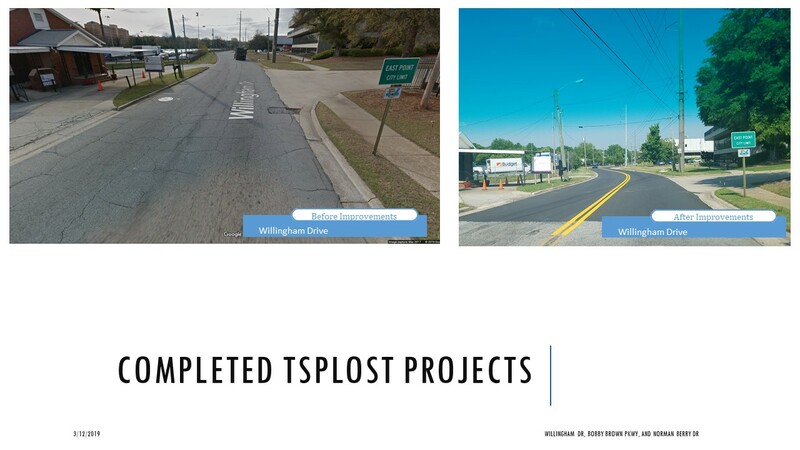 The contract was awarded to Moreland Altobelli Associates, Inc. For more information on this project please contact Cadell Hall, Engineer II, at (404) 669-4321 or chall@eastpointcity.org or Vincent Reynolds, Transportation Manager at (404) 270-7114 or vreynolds@eastpointcity.org . 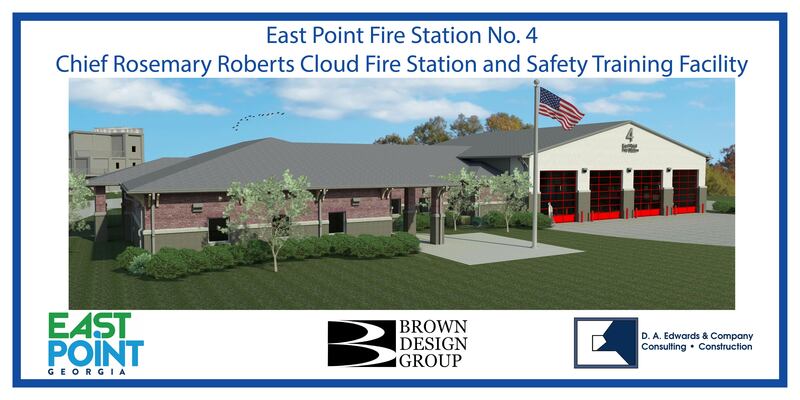 This project is currently in the design phase. 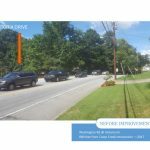 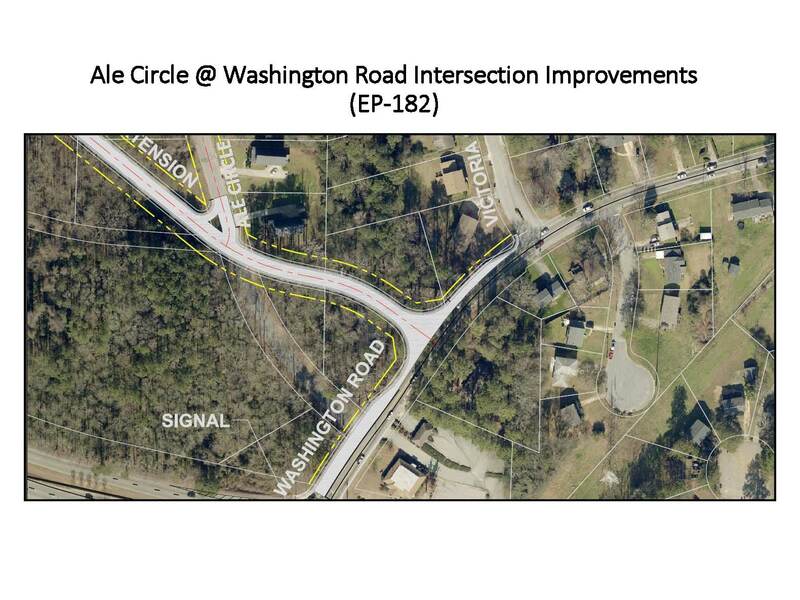 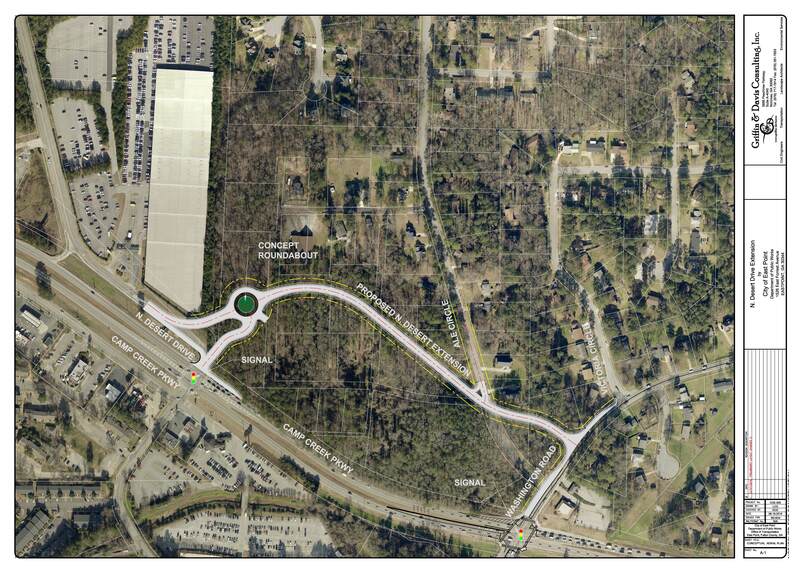 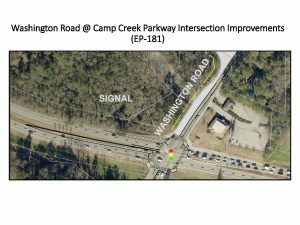 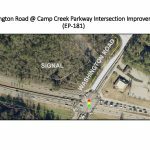 This project will make intersection improvements to the intersection of Washington Road and Camp Creek Parkway. 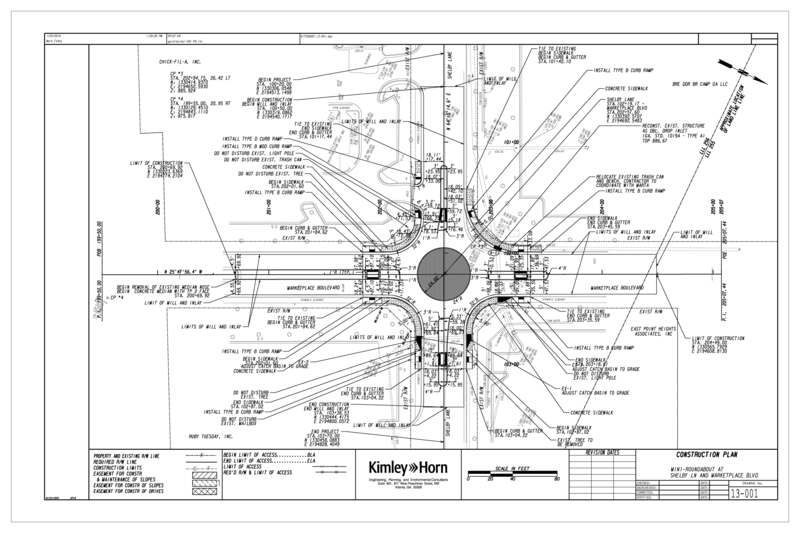 This will be a part of a larger two-phase project. 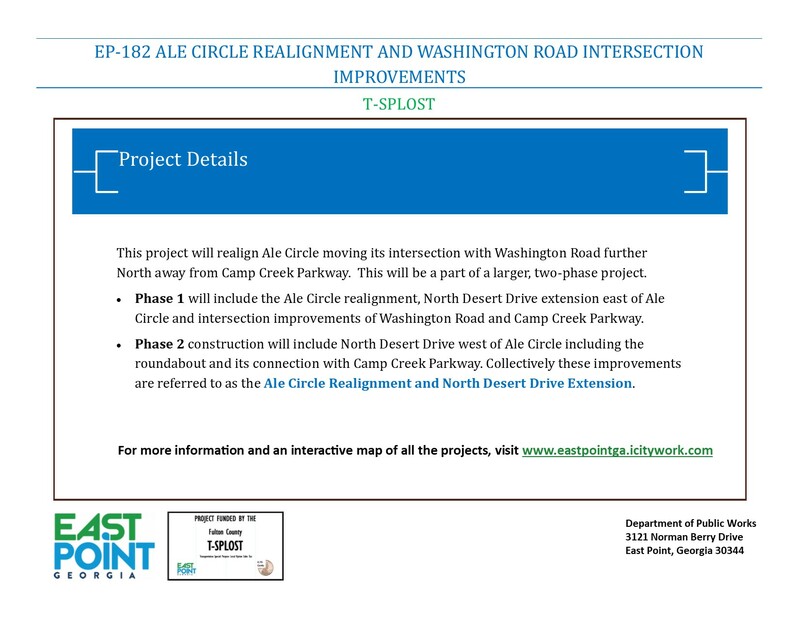 Phase 1 will include the Ale Circle realignment, North Desert Drive extension east of Ale Circle and intersection improvements of Washington Road and Camp Creek Parkway. 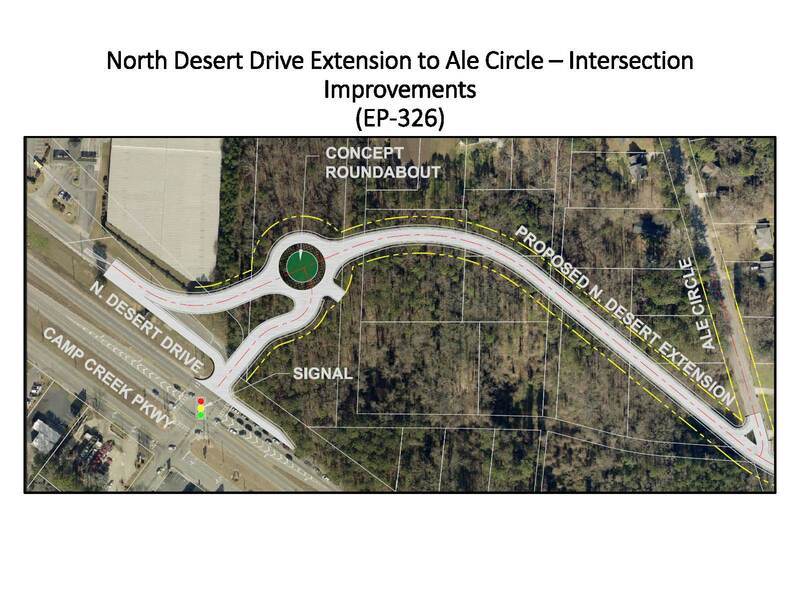 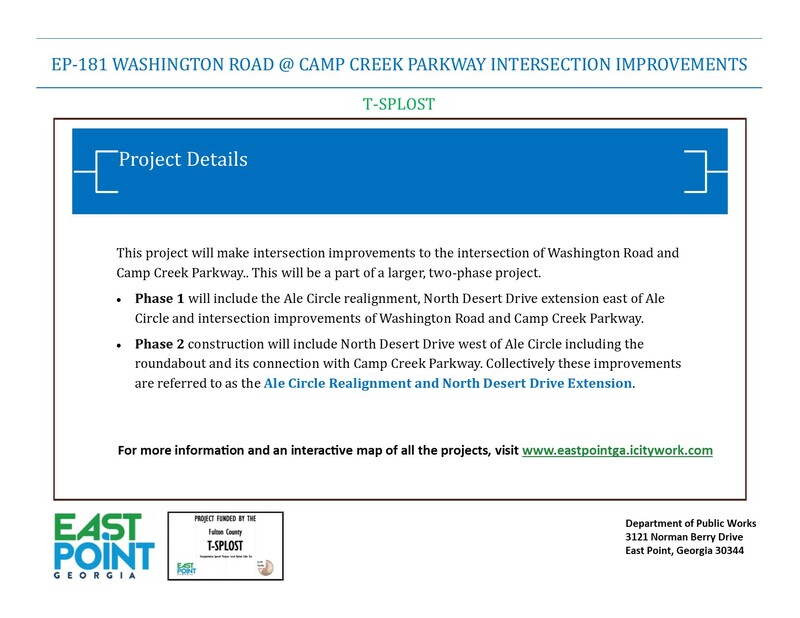 Phase 2 construction will include North Desert Drive west of Ale Circle including the roundabout and its connection with Camp Creek Parkway. 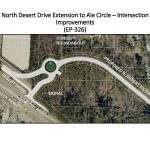 Collectively these improvements are referred to as the Ale Circle Realignment and North Desert Drive Extension. 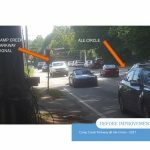 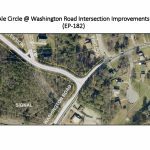 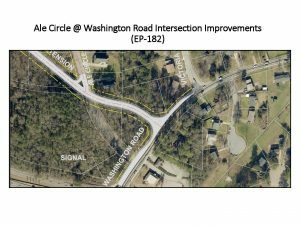 This project will realign Ale Circle moving its intersection with Washington Road further north away from Camp Creek Parkway. 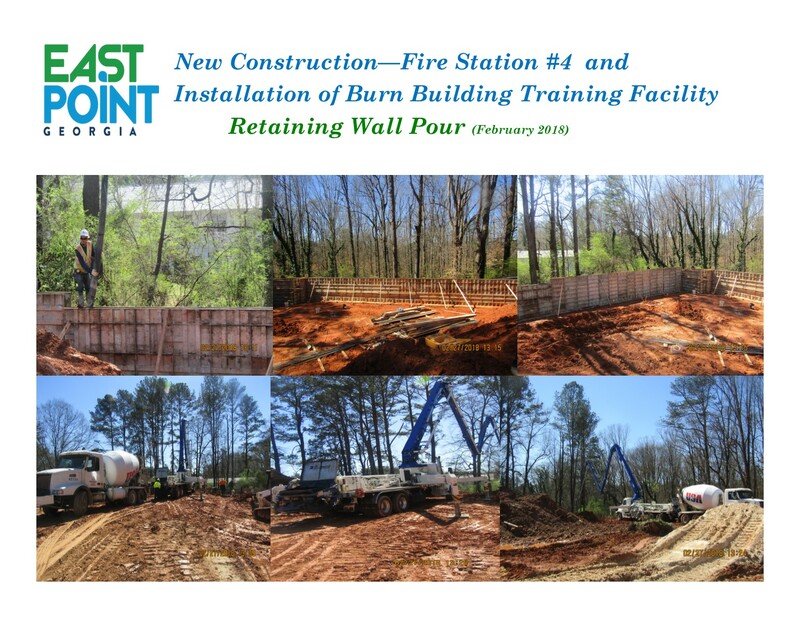 This will be a part of a larger two-phase project. 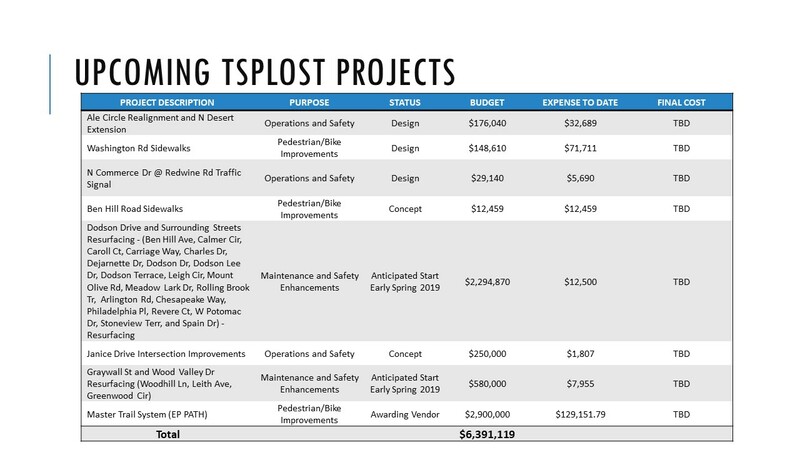 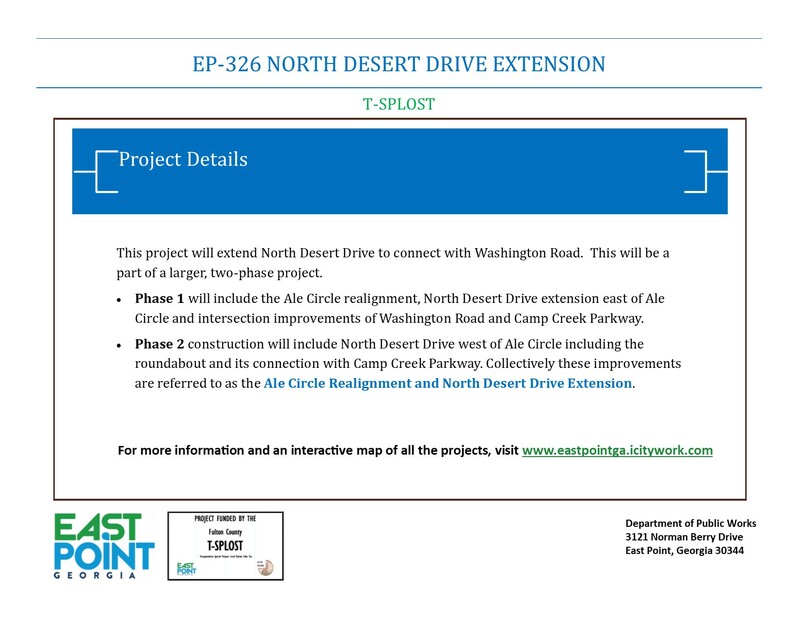 TSPLOST Project EP-326 North Desert Drive Extension will extend North Desert Drive to connect with Washington Road. 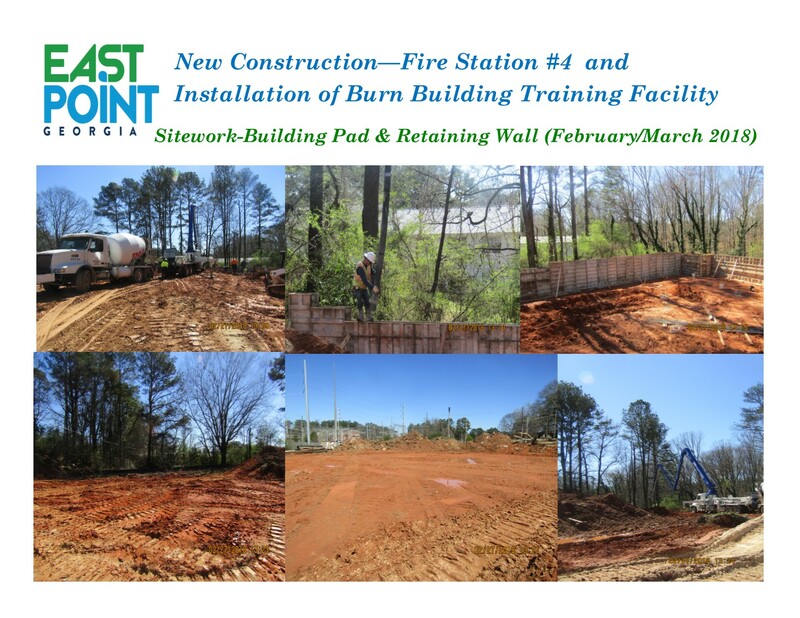 This will be a part of a larger two-phase project. 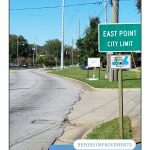 The City of East Point adopted the International Property Maintenance Code in 2007. Via adoption of the code, a task force was created consisting of employees from the Police, Fire and Planning Departments. 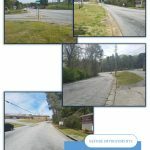 Subsequently, it was recognized that the 2008 housing market crash created a growing number of vacant and abandoned properties. 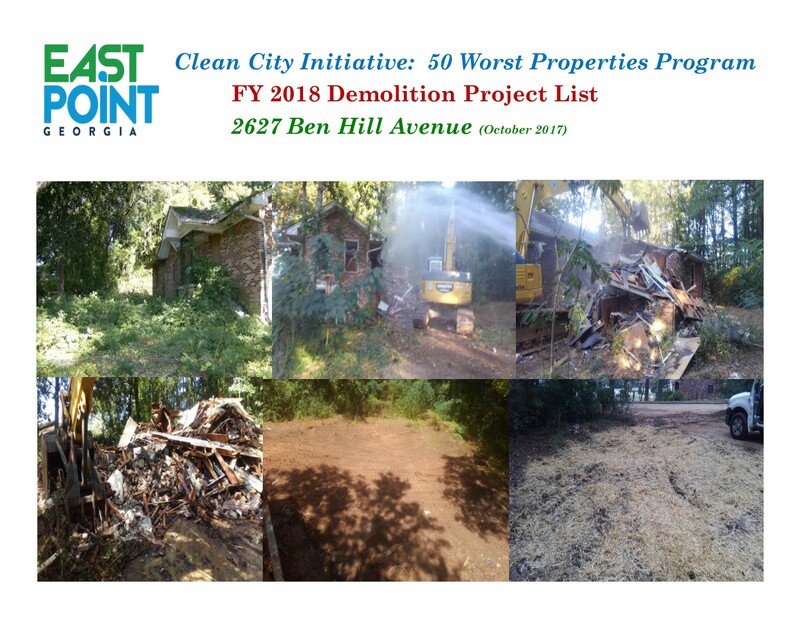 Therefore, in 2010, the 50 Worst Properties Program was created as a housing initiative to address the issue. 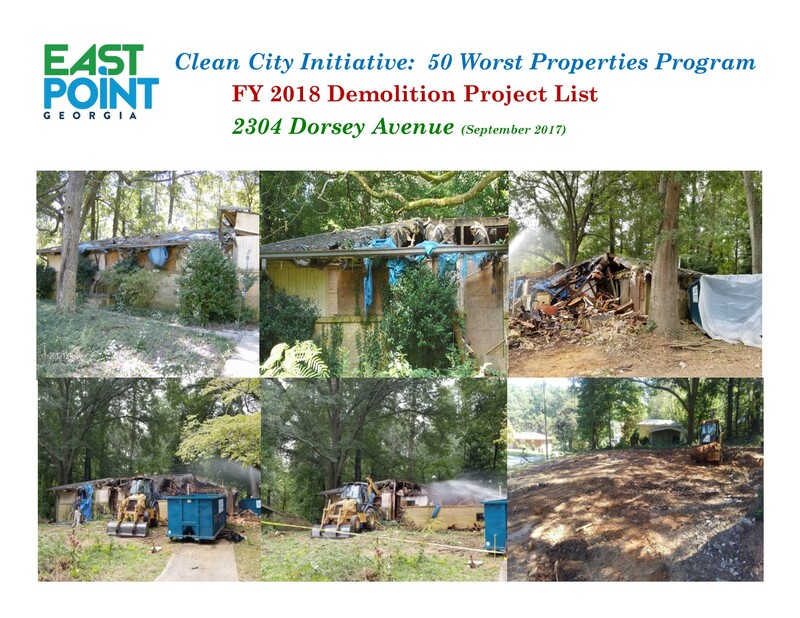 The Task Force actively identified properties that were deemed as unfit for human habitation. Over the course of three (3) years approximately 159-properties have been documented under the program. 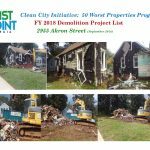 Via court actions, the City has been given permission to secure (board and clean) some of the properties and demolish others. 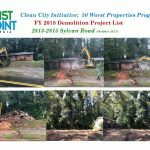 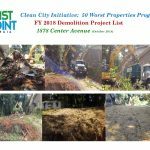 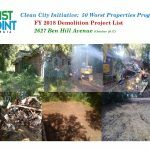 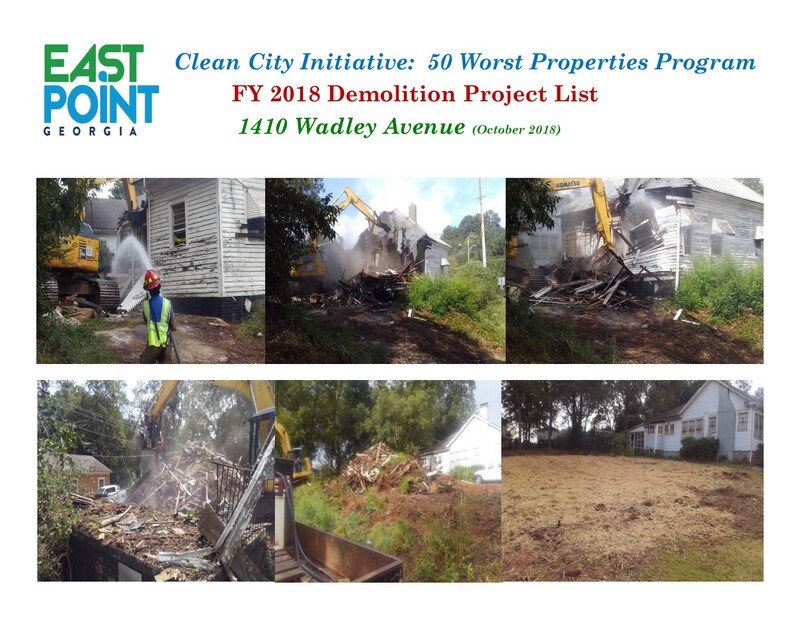 The team was able to demolish eleven (11) properties under the FY 2016 Budget. 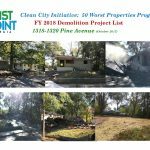 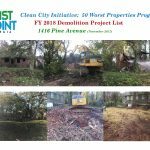 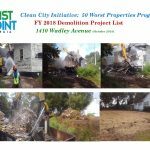 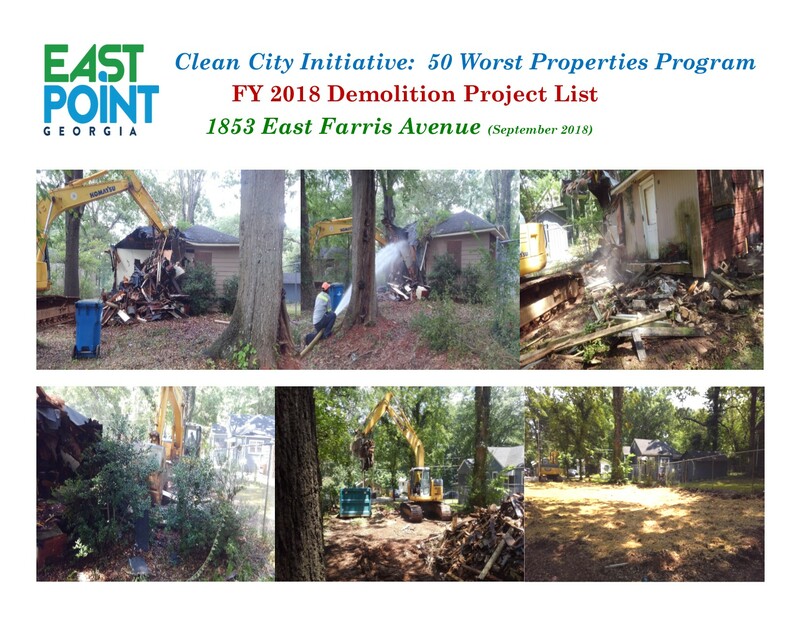 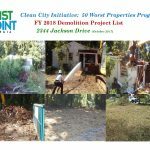 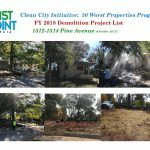 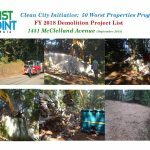 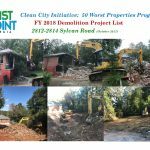 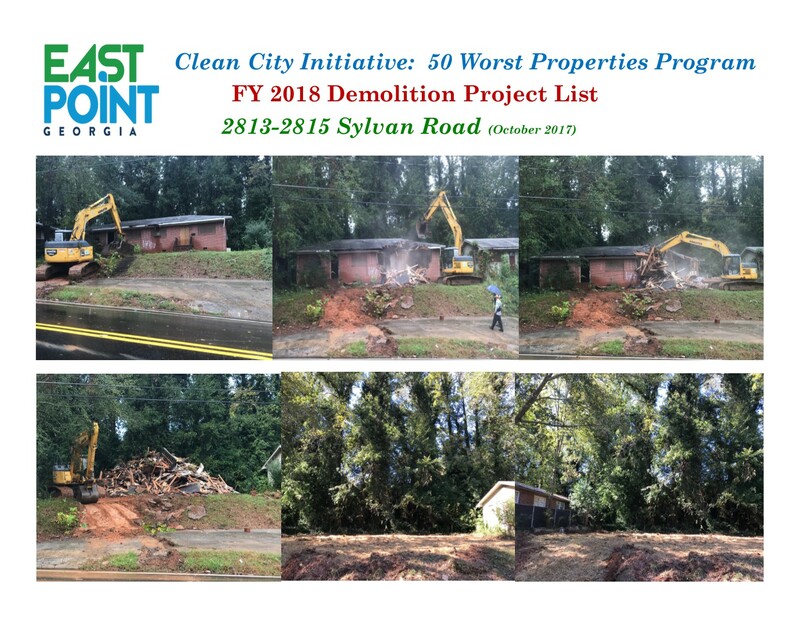 During the FY 2017 Budget, the team demolished an abandoned apartment complex formally known as the Terraces of East Point located between West Woodberry and Langford Parkway (166). 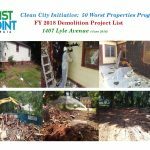 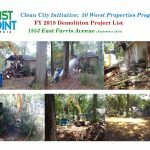 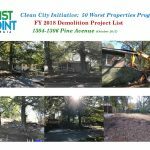 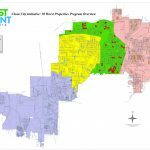 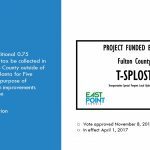 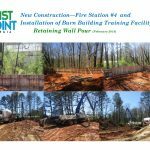 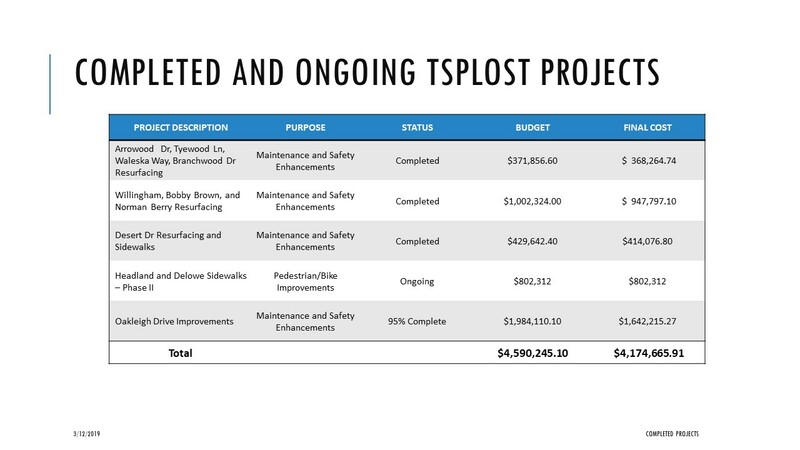 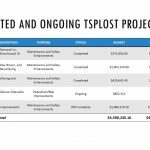 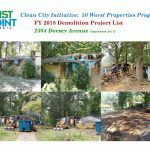 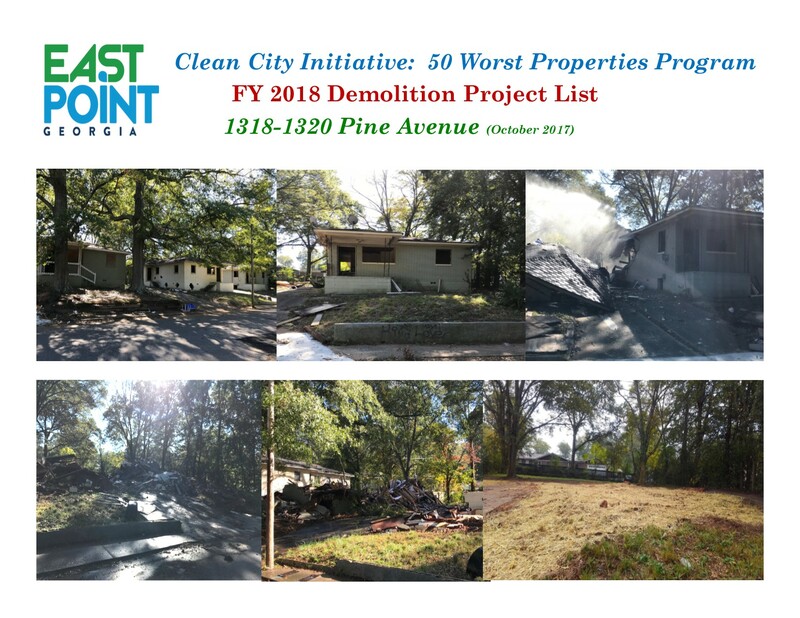 In its FY 2018 Budget, the East Point City Council made possible the creation of a Department to focus on the removal of vacant, blighted unsafe residential structures. 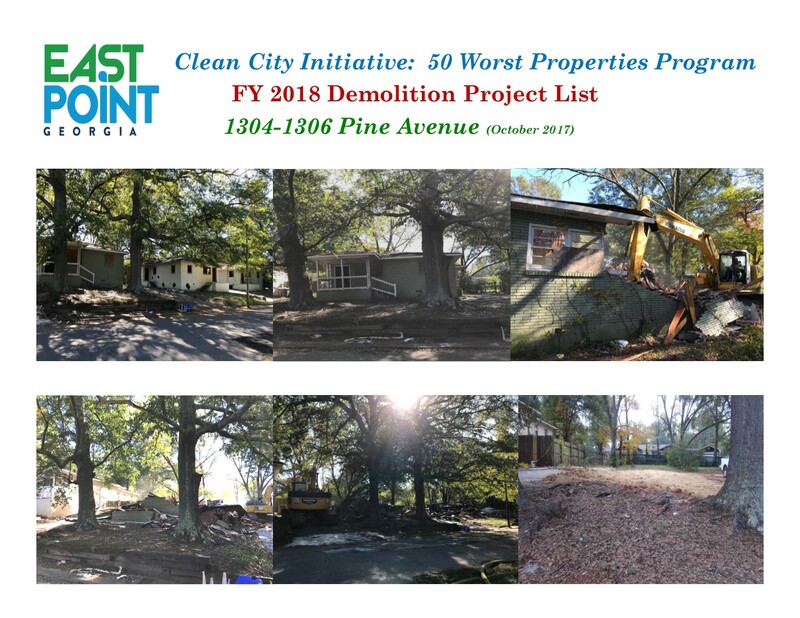 The Department is staffed with three (3) full time employees who perform all activities pertaining to asbestos abatement, demolition, site stabilization, clean-up and maintenance of those properties identified under the program. 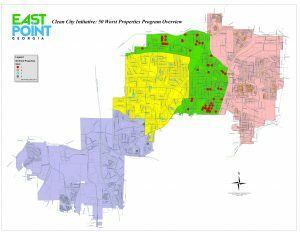 This program is a collaborative effort between the City Manager’s Office, Municipal Court, City Attorney’s Office, Finance and each of the City’s service delivery departments: Planning & Community Development, Fire, Police, EP Power, Public Works-Buildings & Grounds, Water-Sewer and Solid Waste. 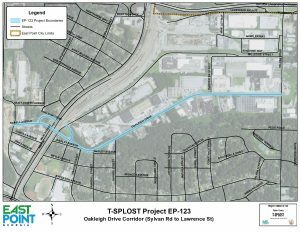 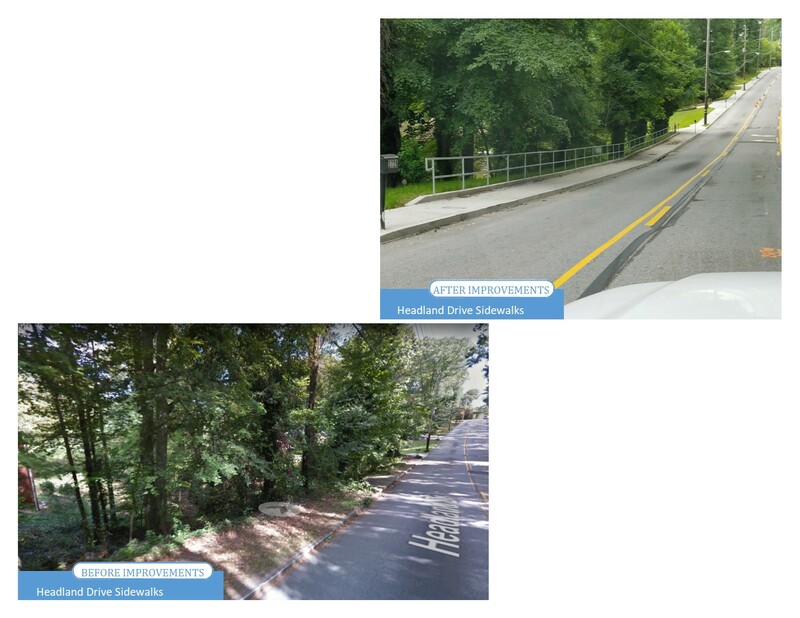 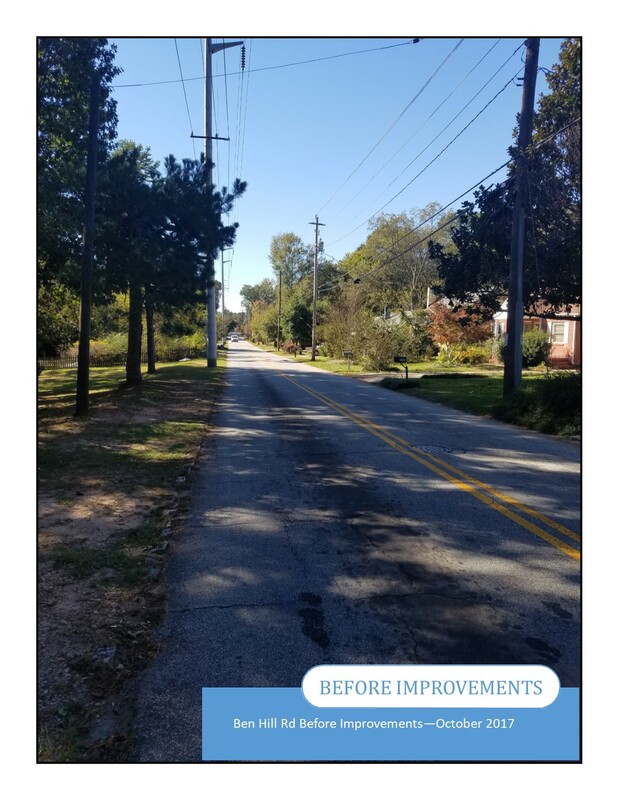 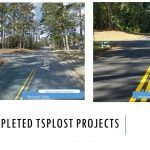 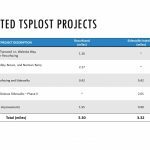 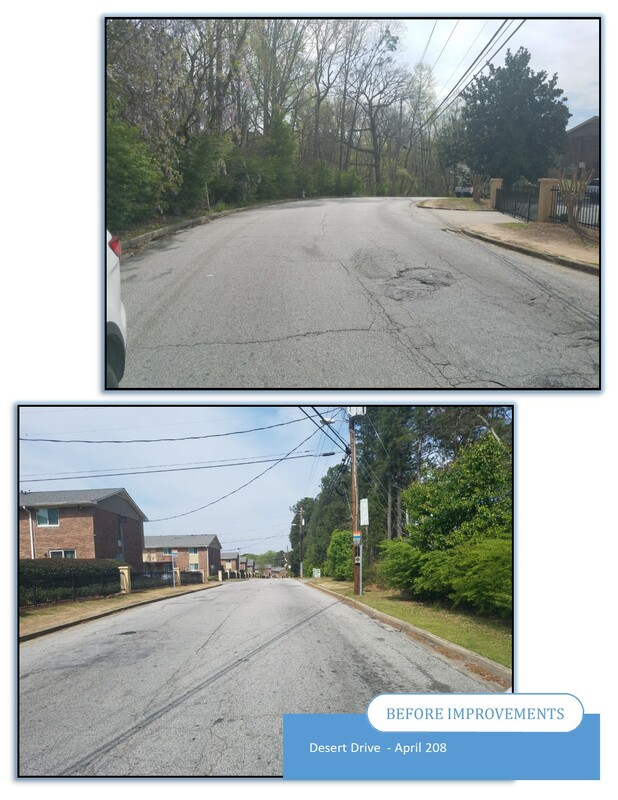 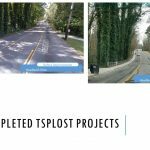 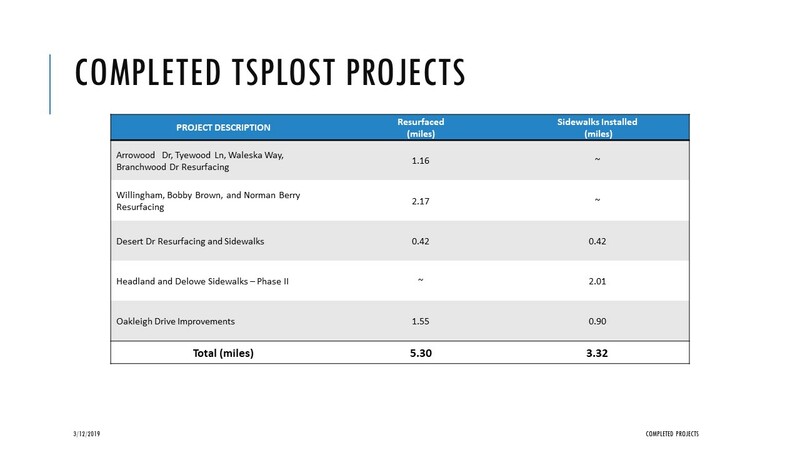 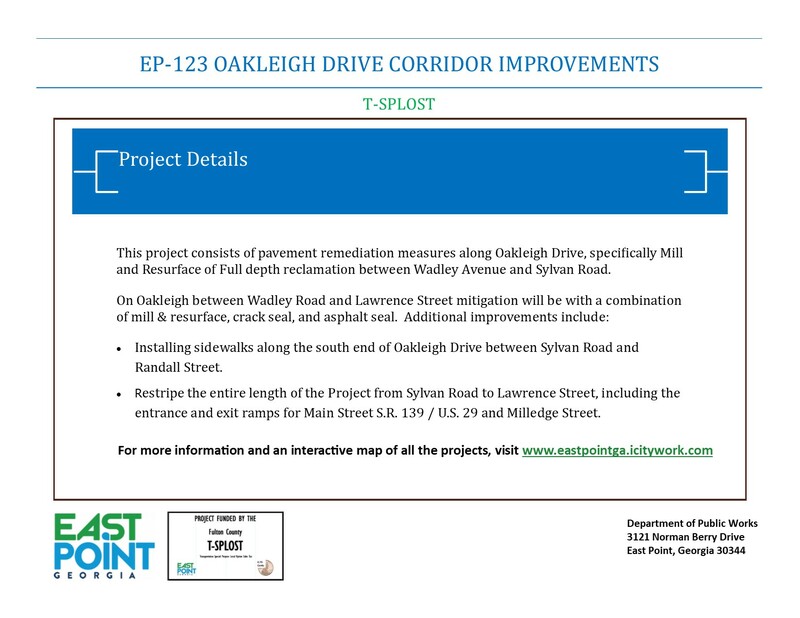 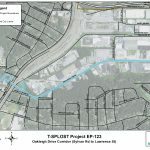 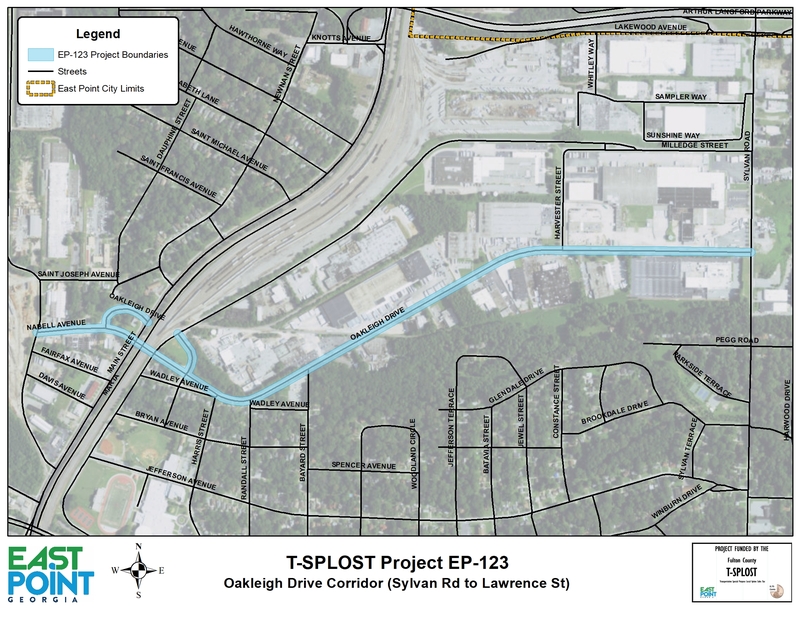 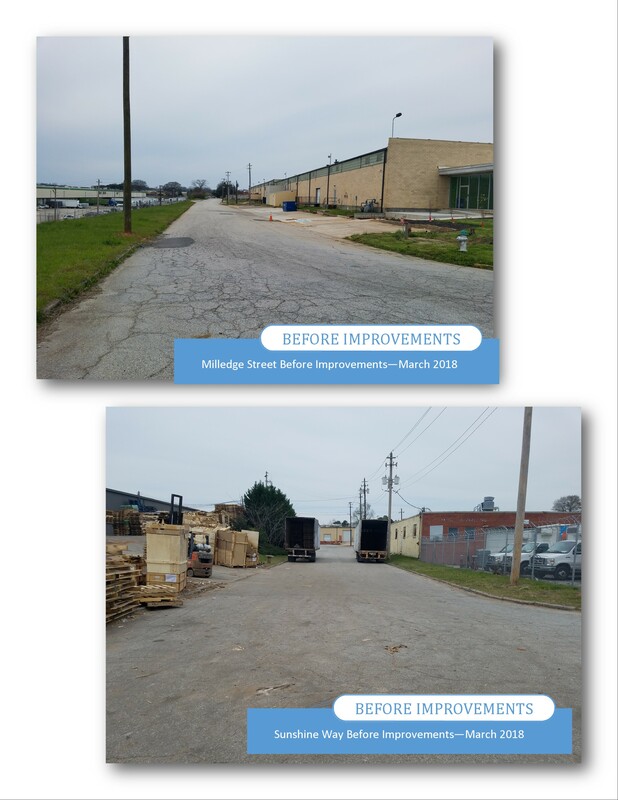 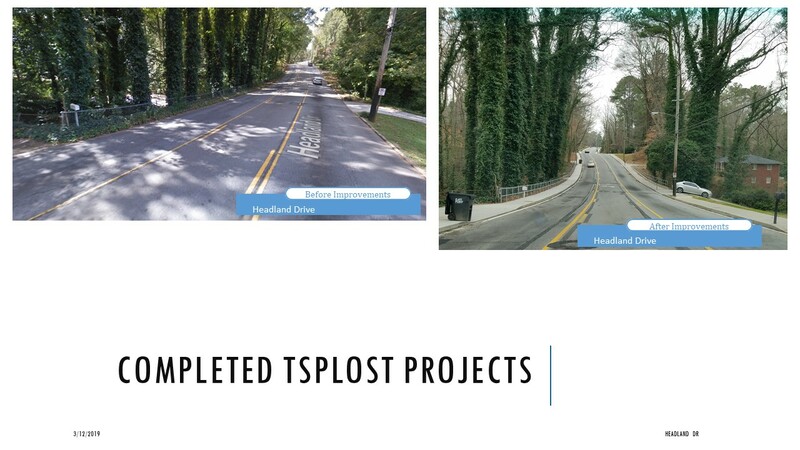 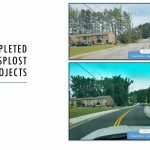 TSPLOST Project EP-123 Oakleigh Drive Corridor Improvements consists of pavement remediation measures along Oakleigh Drive, specifically Mill and Resurface of Full depth reclamation between Wadley Avenue and Sylvan Road. 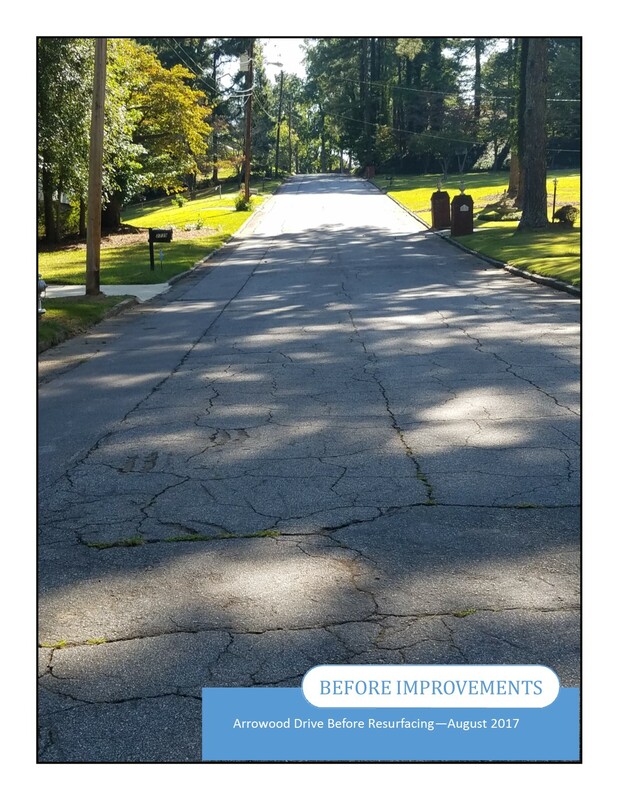 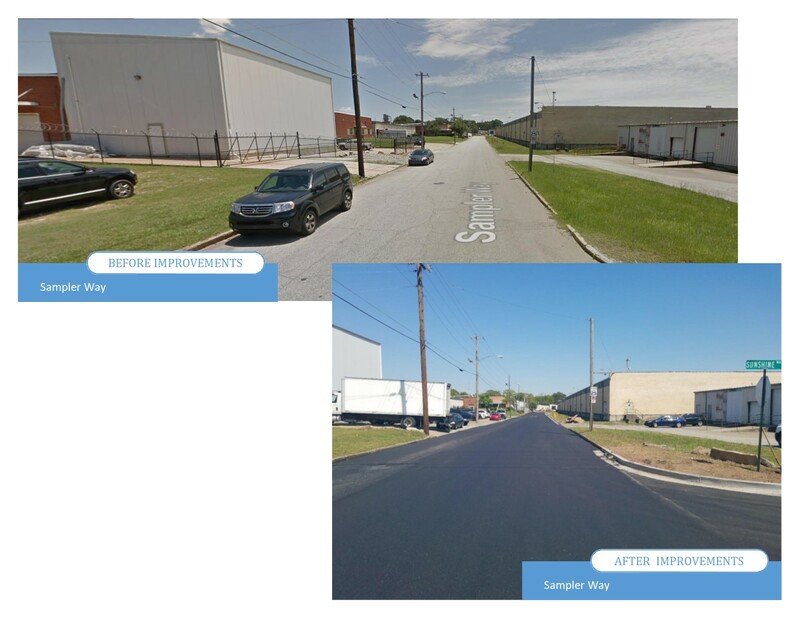 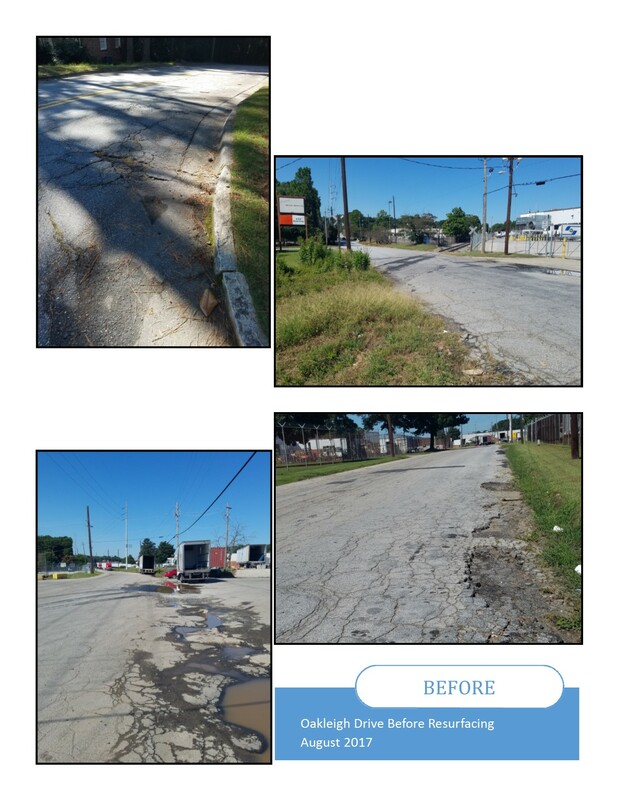 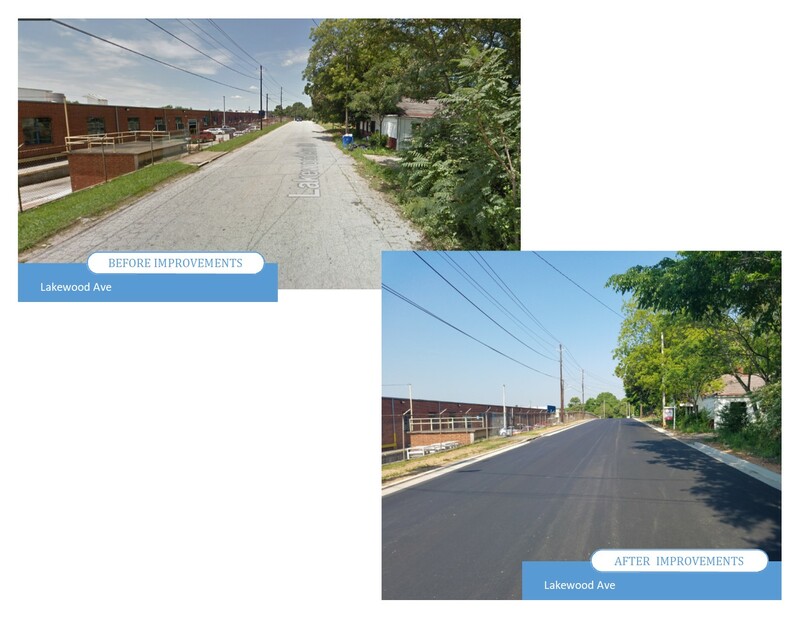 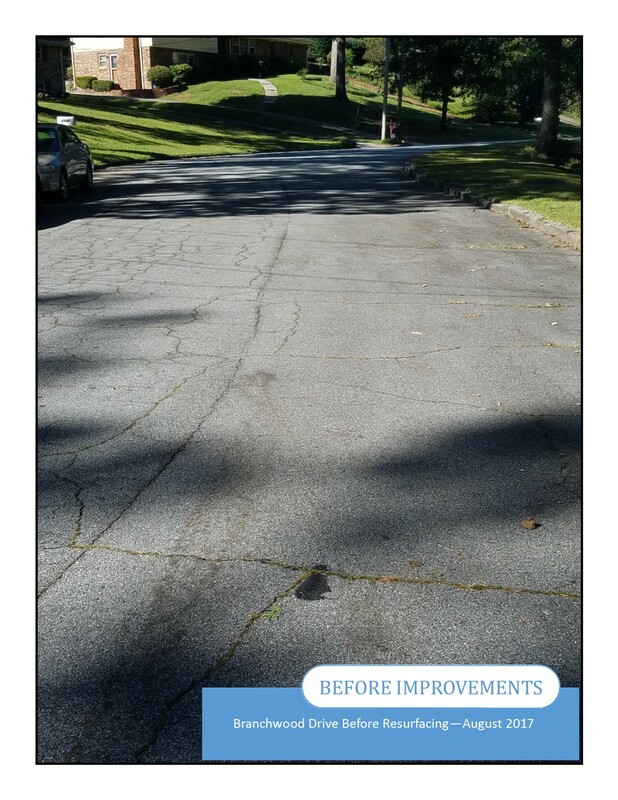 On Oakleigh between Wadley Road and Lawrence Street mitigation will be with a combination of mill & resurface, crack seal, and asphalt seal. 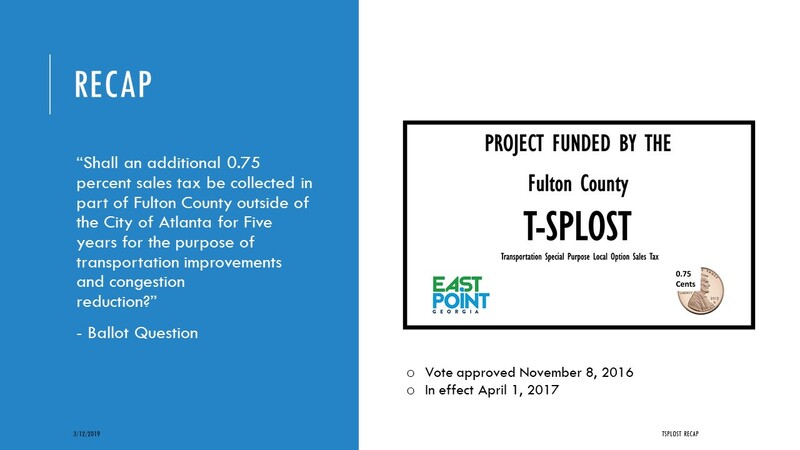 The contract was awarded to BRTU Construction, Inc. For more information on this project please contact Cadell Hall, Engineer II, at (404) 669-4321 or chall@eastpointcity.org or Vincent Reynolds, Transportation Manager at (404) 270-7114 or vreynolds@eastpointcity.org . 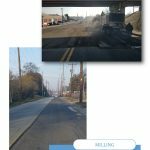 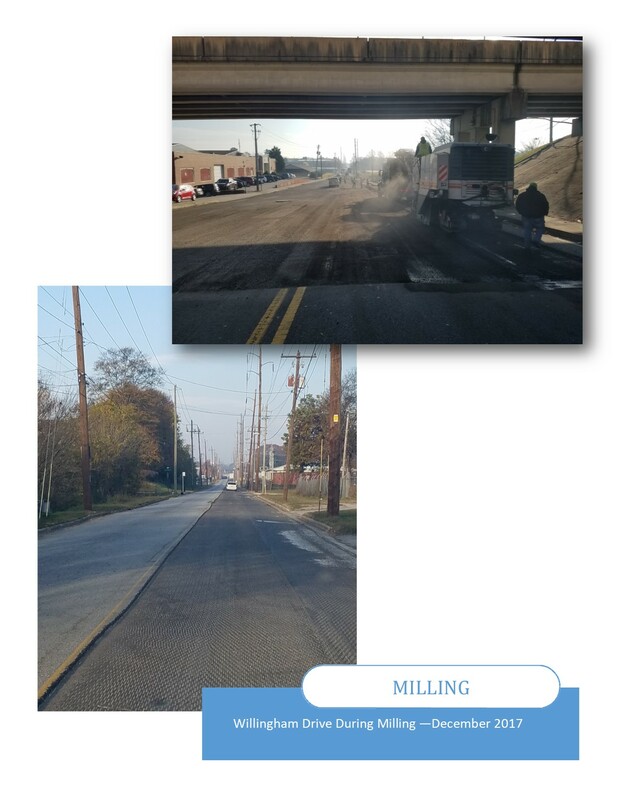 This project consists of the milling of existing asphalt and overlaying with new pavement material along Willingham Drive from E Main Street to East Point City Limits. 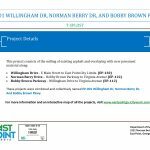 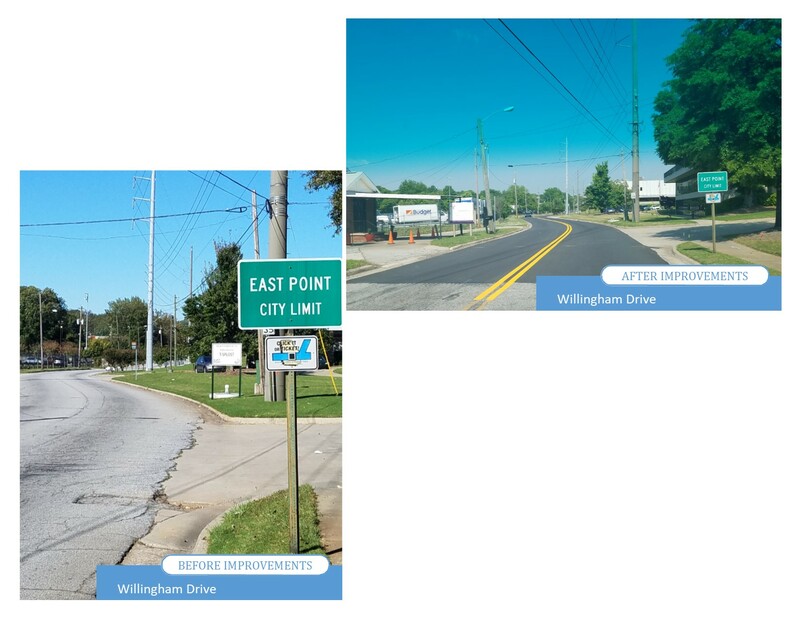 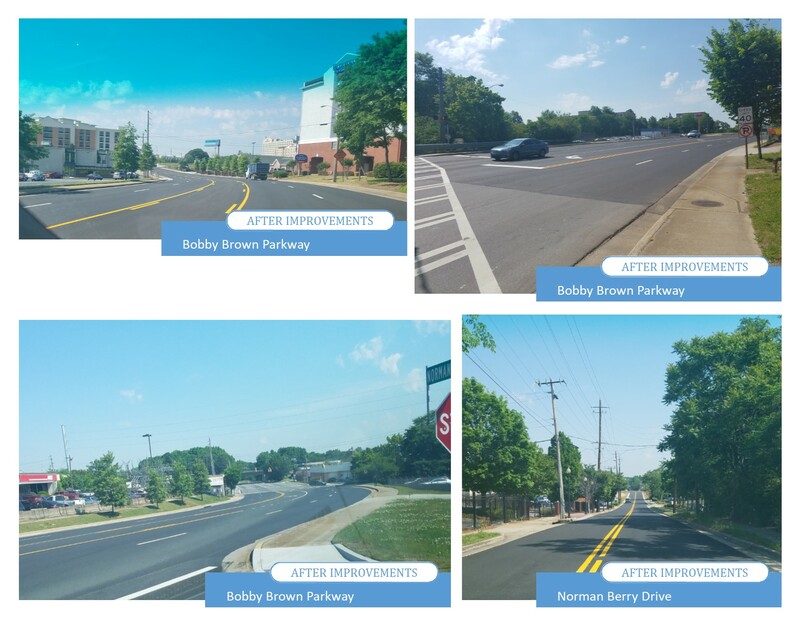 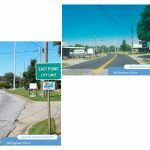 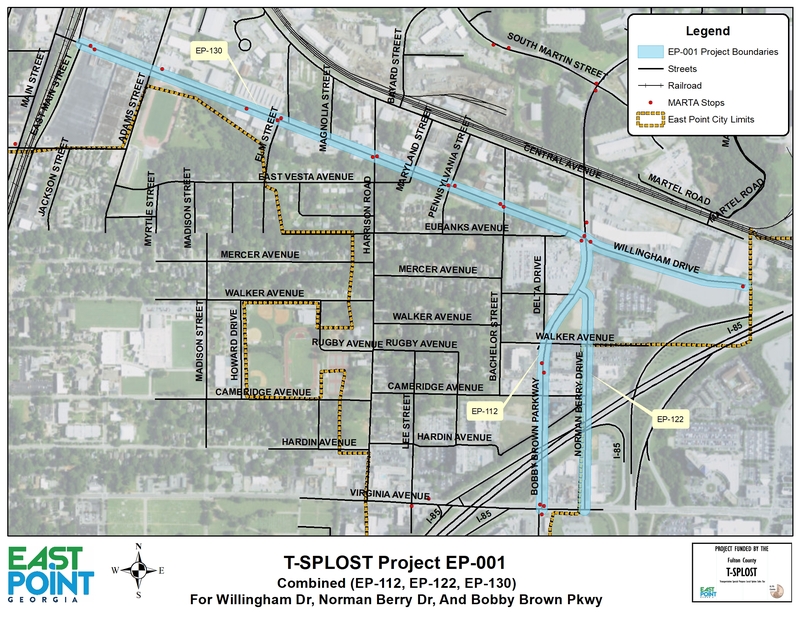 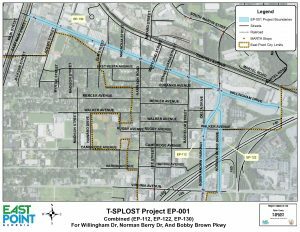 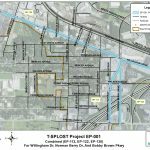 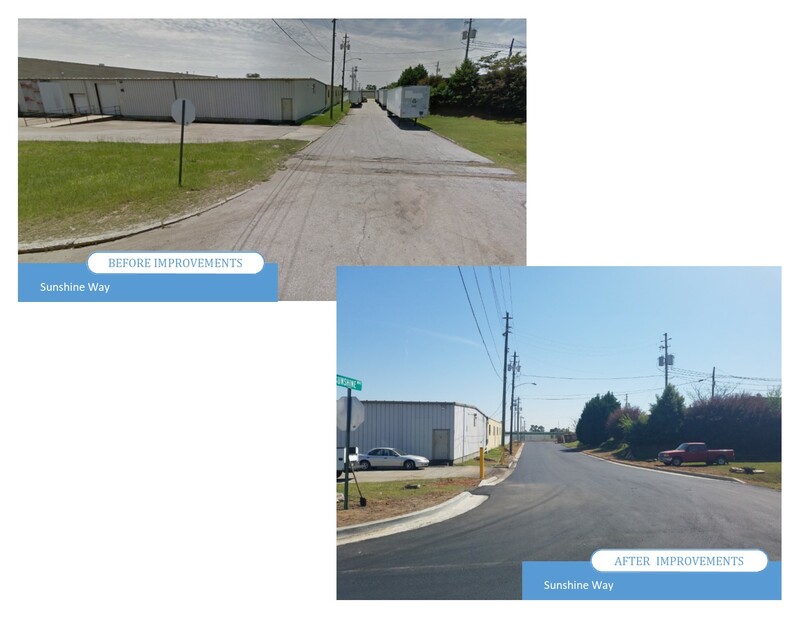 The milling and overlaying of Willingham Drive, Norman Berry Drive, and Bobby Brown Parkway were combined and collectively named EP-001 Willingham Drive, Norman Berry Drive, and Bobby Brown Parkway. 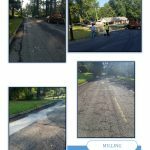 The contract was awarded to Mullins Brothers Paving Contractors. 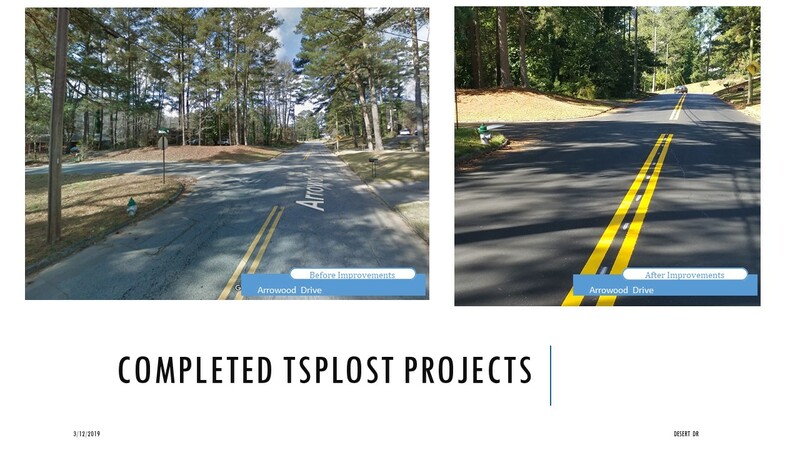 For more information on this project please contact Cadell Hall, Engineer II, at (404) 669-4321 or chall@eastpointcity.org or Vincent Reynolds, Transportation Manager at (404) 270-7114 or vreynolds@eastpointcity.org . 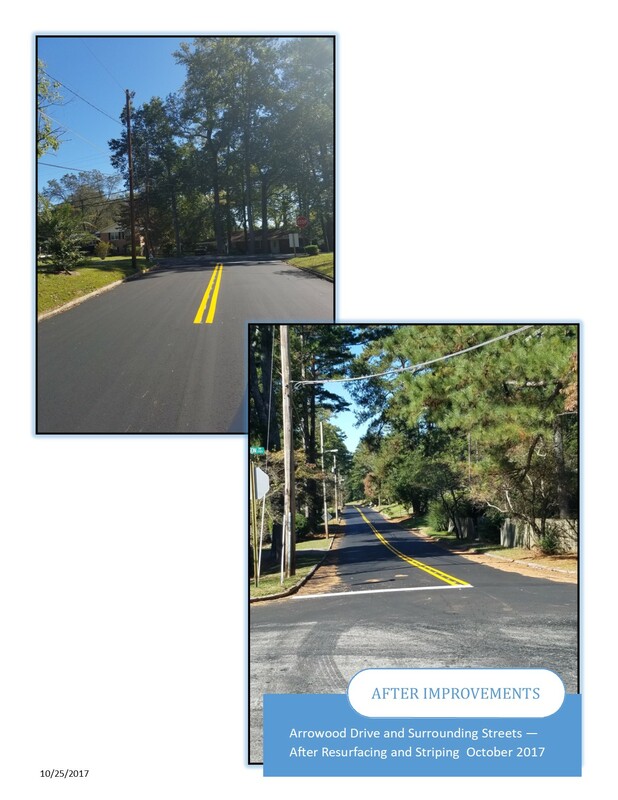 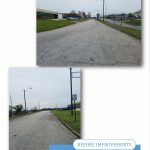 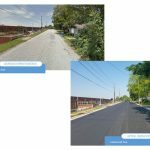 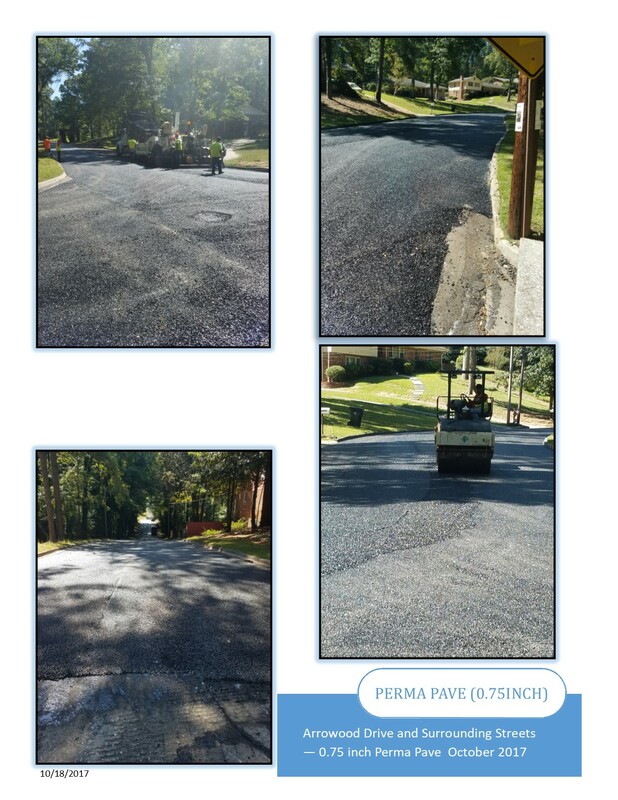 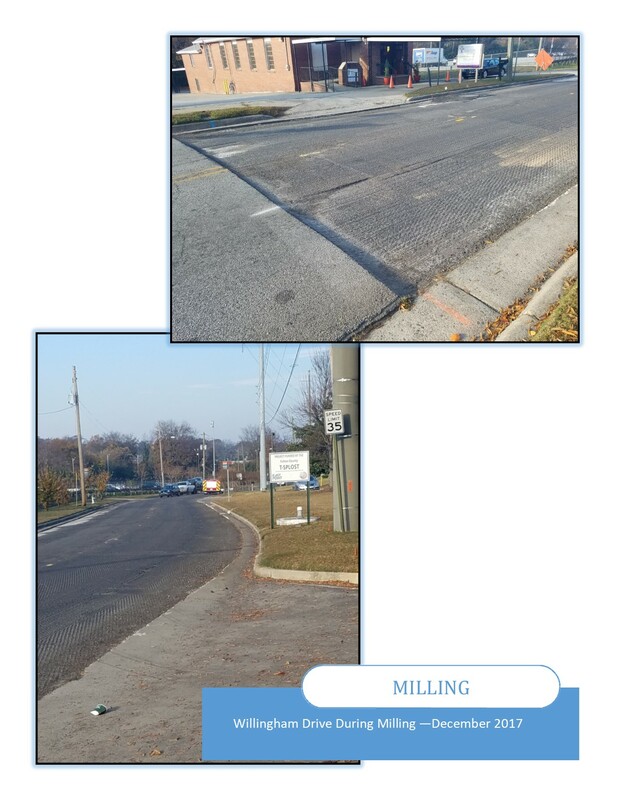 This project consisted of the milling of existing asphalt and overlaying with new pavement material along Branchwood Drive from Kingston Terrace to end of street. 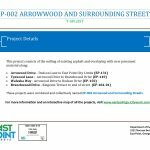 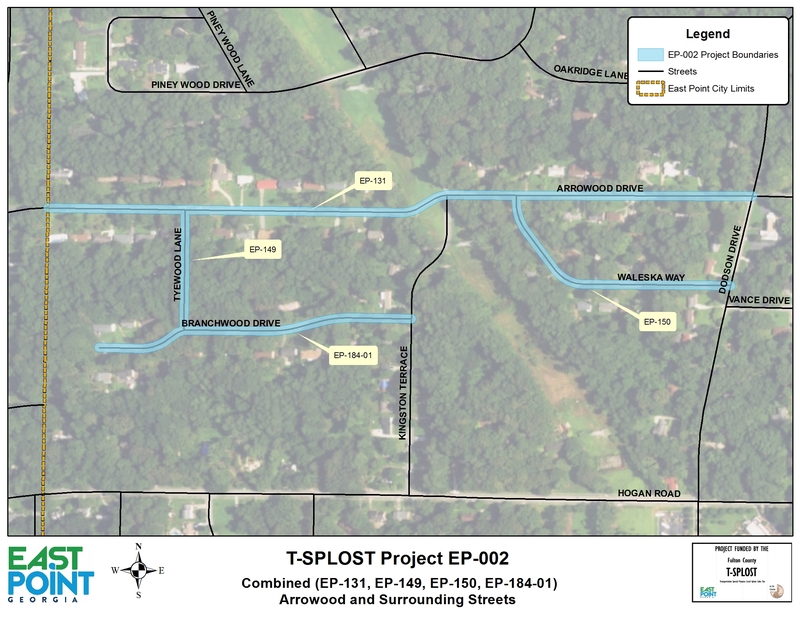 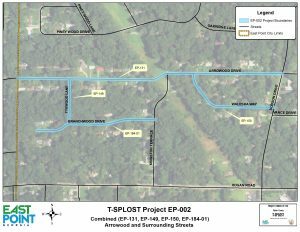 The milling and overlaying of Arrowood Drive, Tyewood Lane, Waleska Way, and Branchwood Drive were combined and collectively named EP-002 Arrowood and Surrounding Streets. 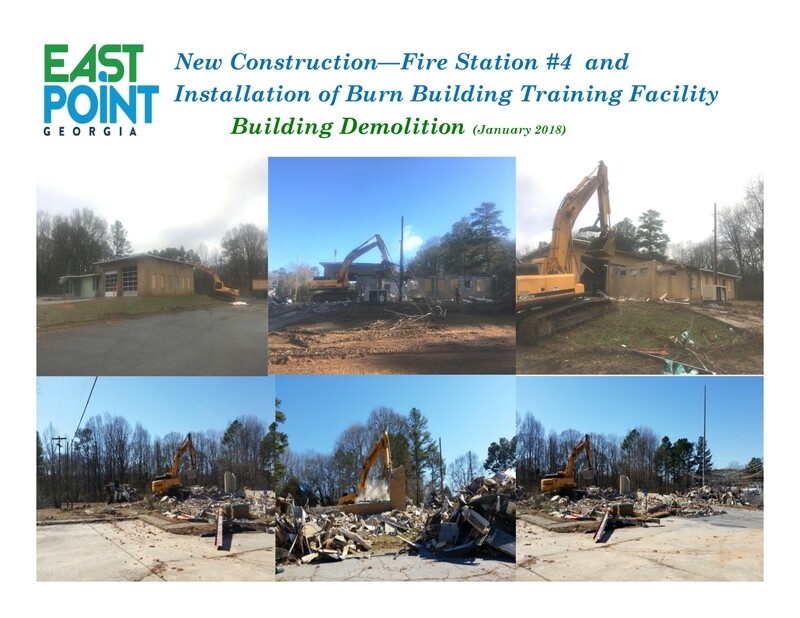 Demolition of existing Fire Station #4. 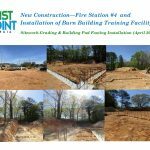 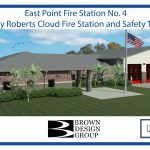 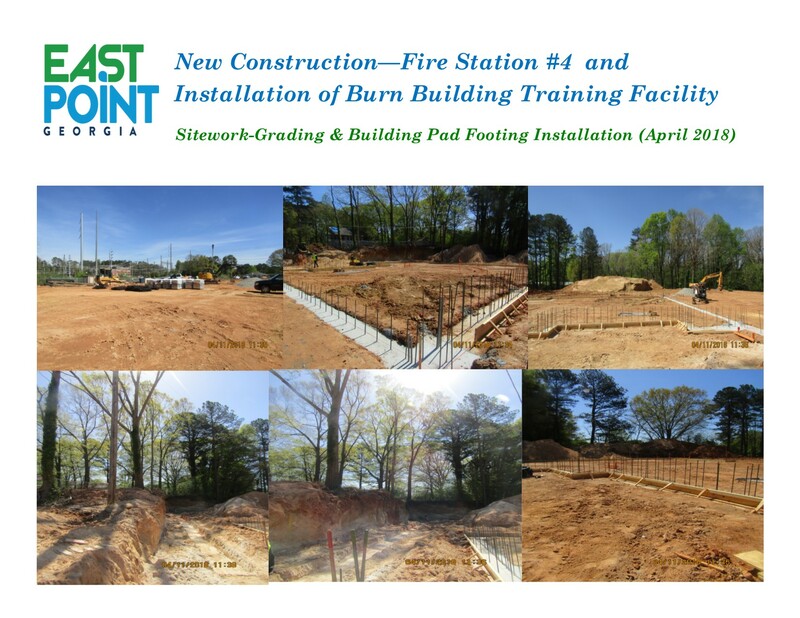 Construction of a new 12,000sf Fire Station with four (4) engine bays. 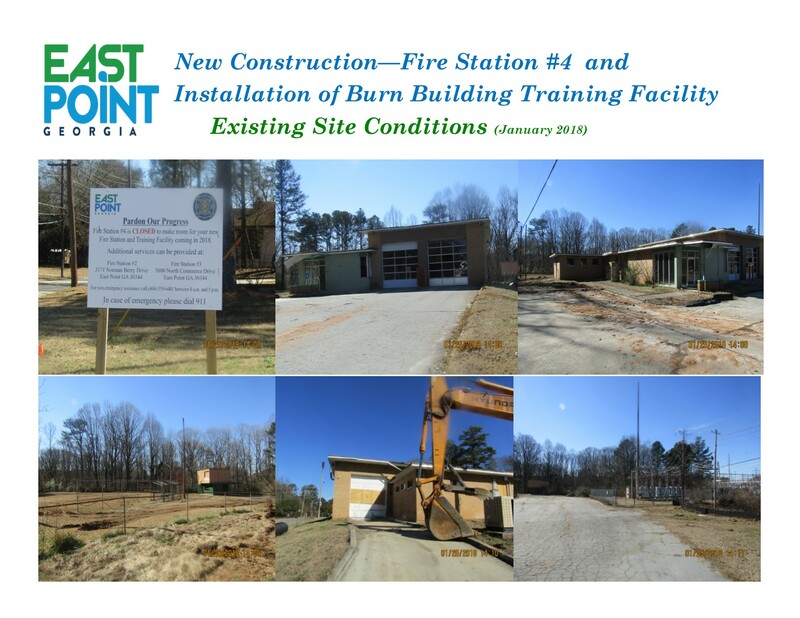 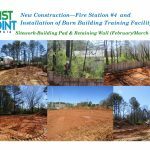 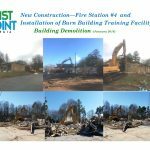 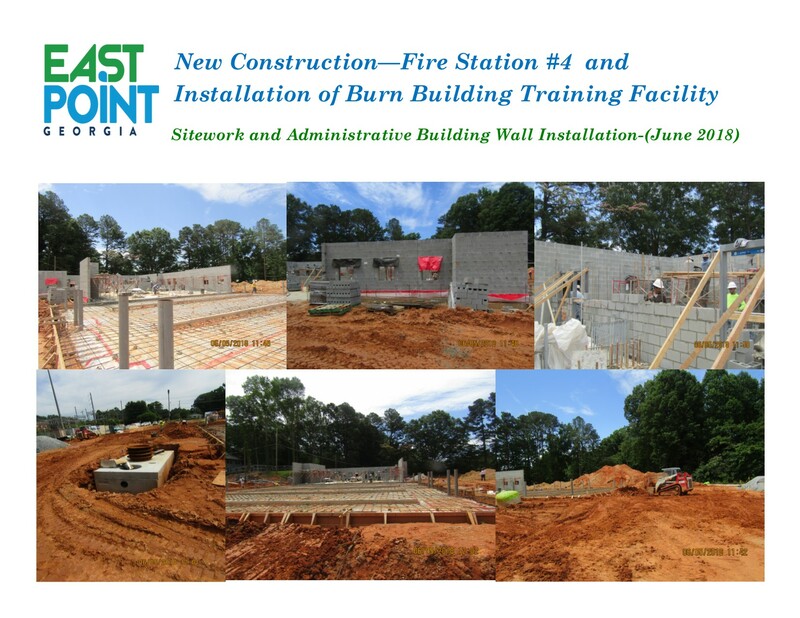 Installation of a manufactured burn building to be used as a training facility. 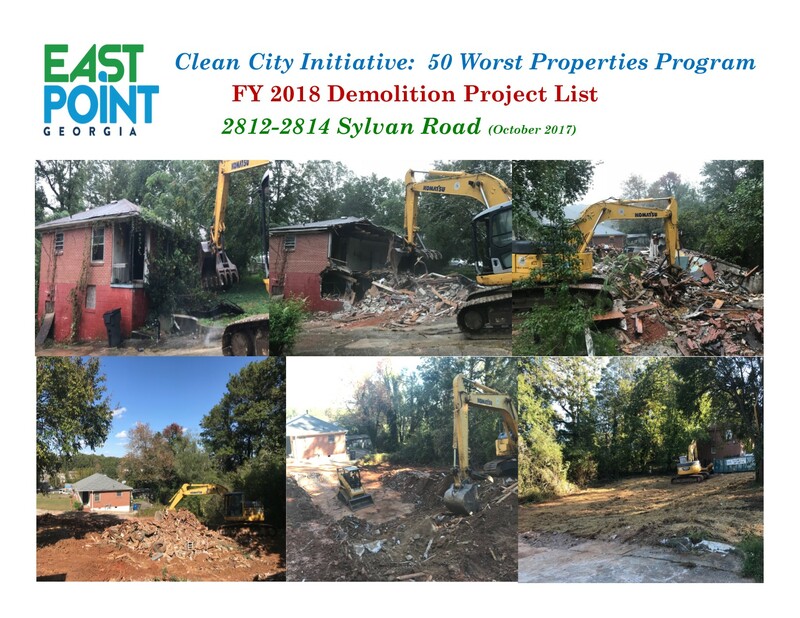 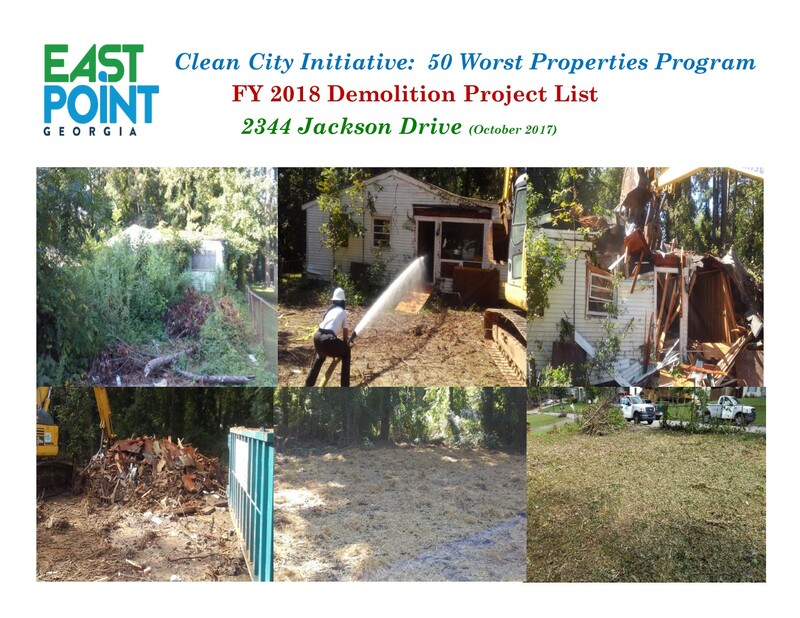 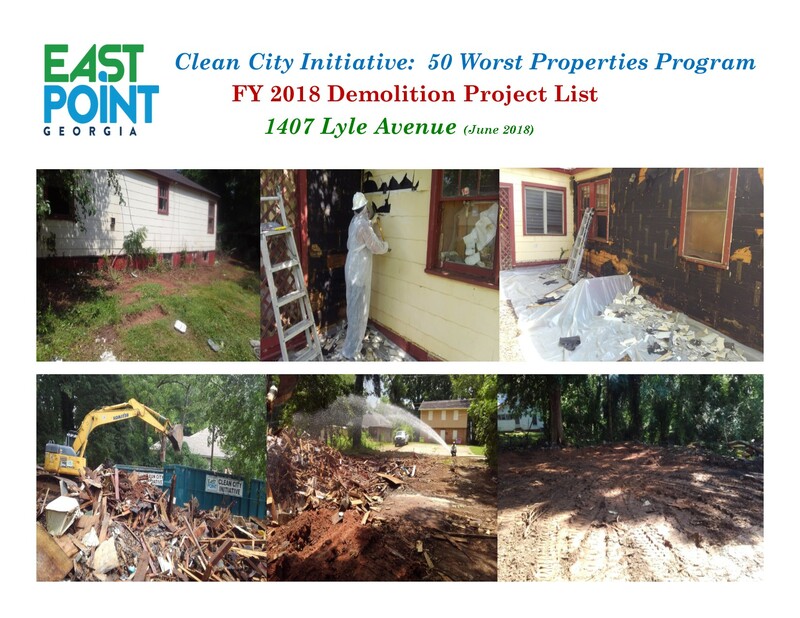 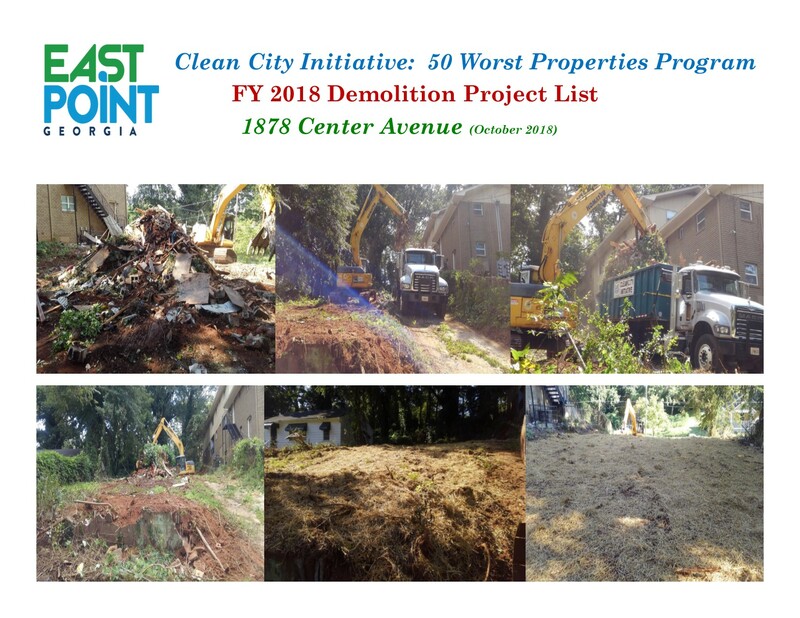 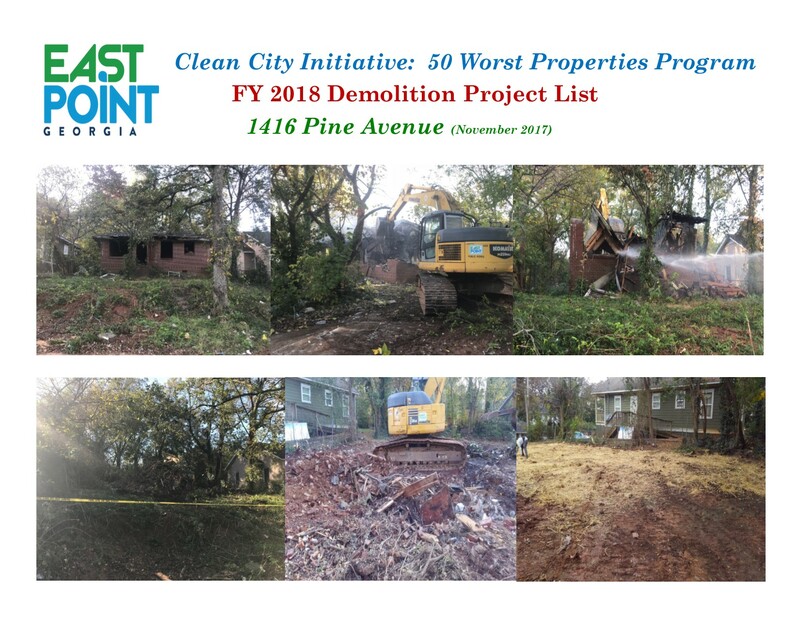 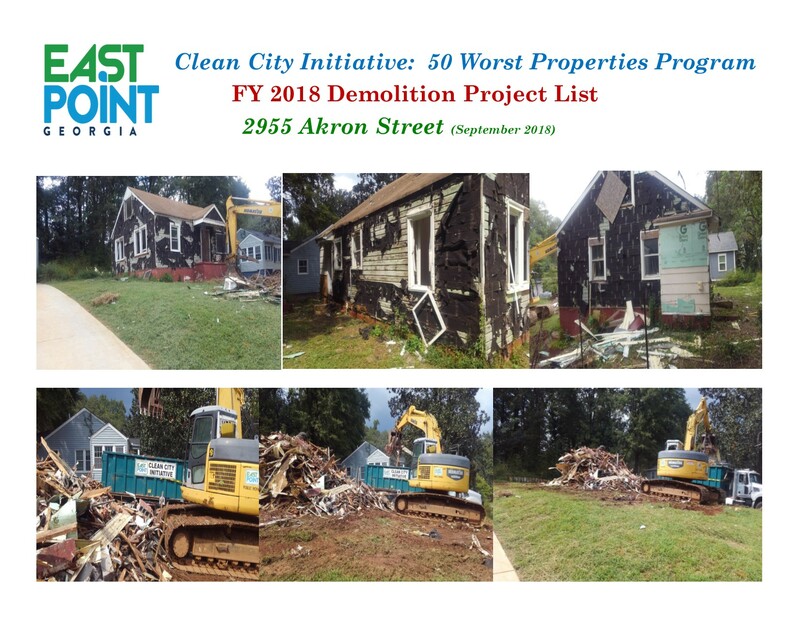 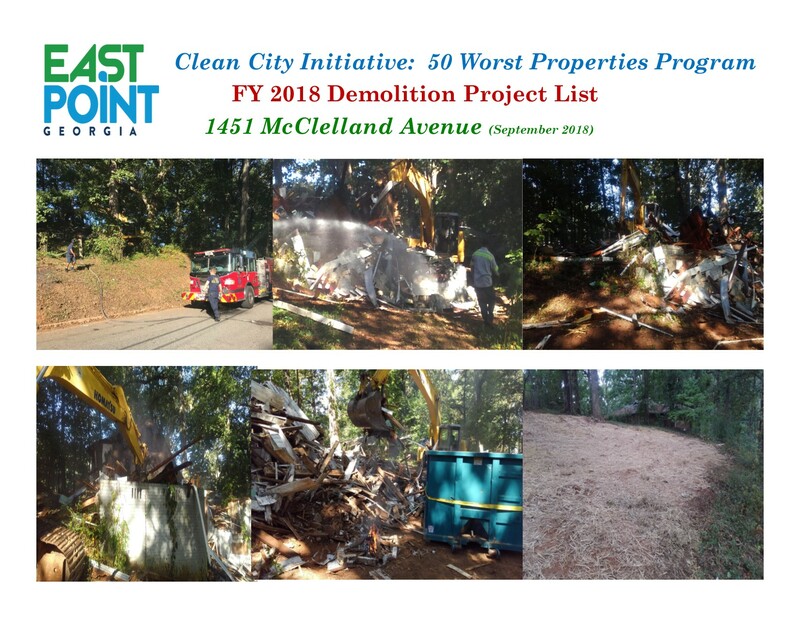 The 50 Worst Properties Program is a housing initiative that is focused on the removal of blighted unsafe residential structures, thereby improving the quality of life in existing neighborhoods. 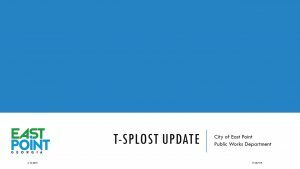 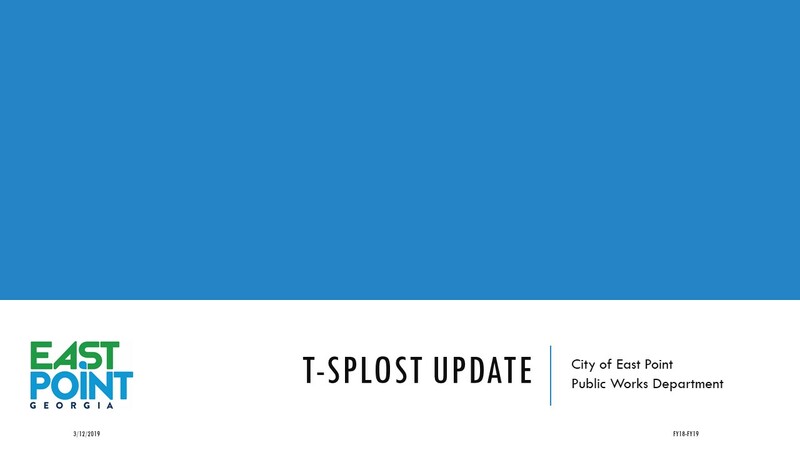 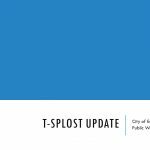 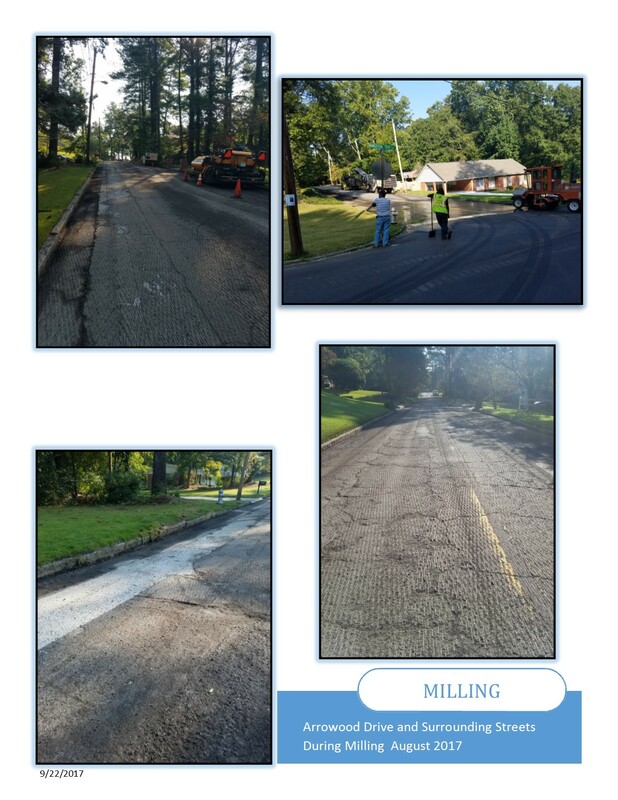 TSPLOST Project EP-184-01 Milling and Inlay Resurfacing for Branchwood Drive - Kingston Terrace to end of street.